The Clifton Park Town Center Plan. Figure 1.1. 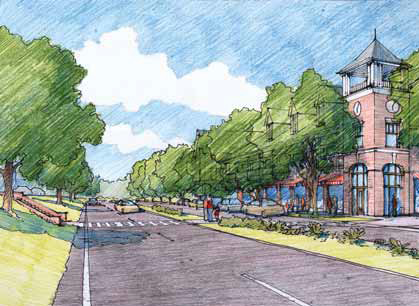 Conceptual rendering of Clifton Country Road, as envisioned in the Clifton Park Town Center Plan, includes on-street parking and retail shopfronts in a more pedestrian-oriented environment. Figure 1.2. 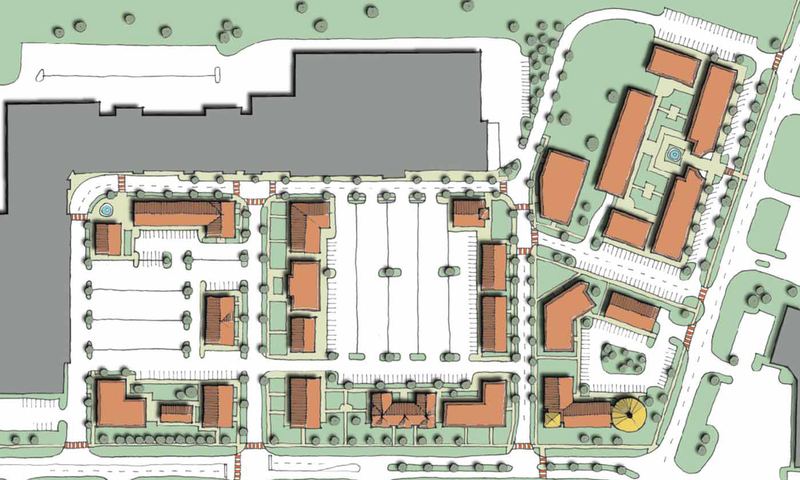 Partial conceptual plan rendering of Clifton Park Town Center, depicting new infill development, linear parks and a parking garage around the mall. Figure 1.3. Conceptual perspective rendering of Clifton Park Town Center, depicting the potential of a vibrant new mixed-use neighborhood of shops and apartments. In 2011, the Town of Clifton Park sought to develop a consensus vision for the look, feel and function of a future "Town Center" in its existing Exit 9 commercial area. Funding for this effort was provided by the Capital District Transportation Committee (CDTC). 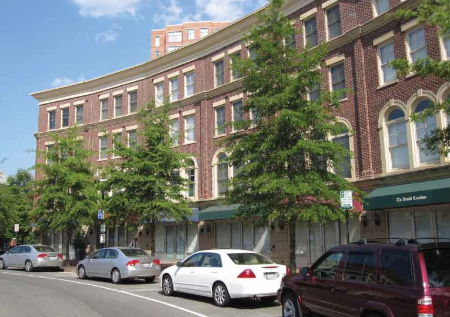 Town officials, with the assistance of planning consultants, worked to imagine how this neighborhood could evolve over time with redevelopment into a more-attractive mixed-use commercial center of activity. The goal was to create a rich atmosphere which was pedestrian and bicycle friendly and the "heart" of the community. Two public workshops were held to invite local residents, business owners and landowners to discuss what they would like to see. 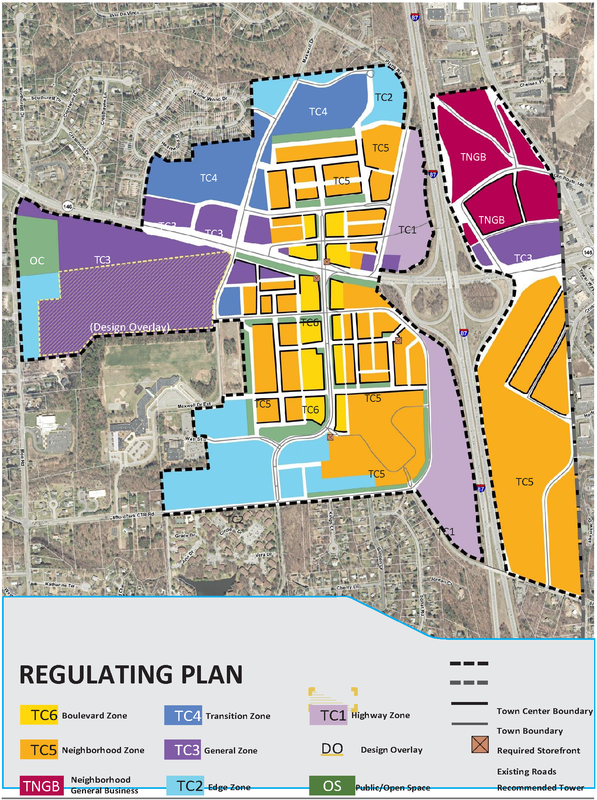 The result of these dialogs was used to shape a guidance document titled "The Clifton Park Town Center Plan," which was adopted in April of 2012. How and why this code was created. It was understood that in order to realize the ideas and visions outlined in the Clifton Park Town Center Plan, the existing zoning for this area of town would need to be reconstructed, and consensus built among local residents and property owners about how it should work. 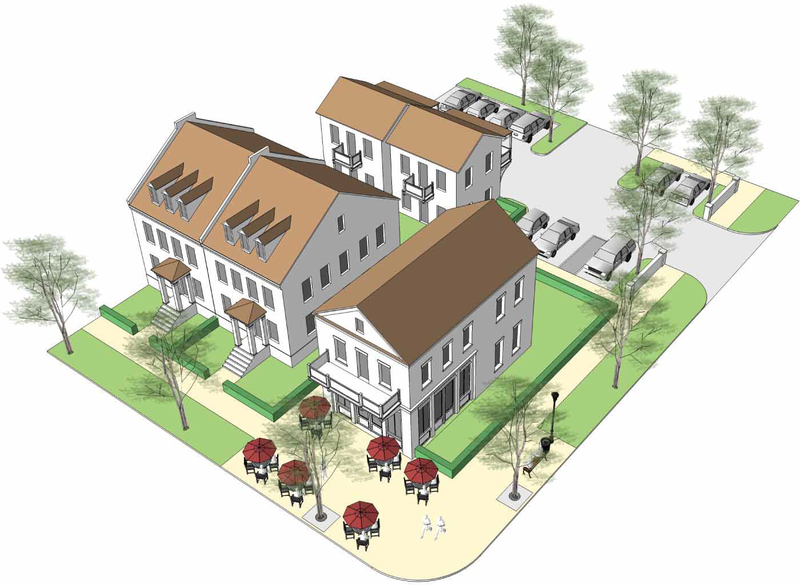 A form-based zoning approach was chosen because it utilizes graphics to explain what the desired form and appearance of development should be with an eye toward creating beautiful places and a streamlined development review process which encourages revitalization. 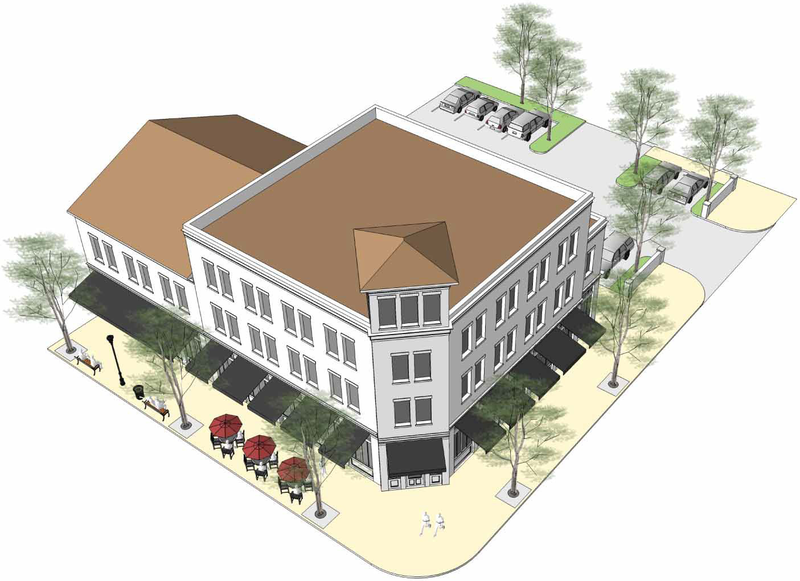 With the assistance of additional funding by the CDTC, the follow-up work was commenced in 2013 to develop a new form-based zoning code which would allow and encourage the type of redevelopment outlined in the Town Center Plan. Two additional public workshops were held to discuss the specific ideas and approaches to this form-based zoning. 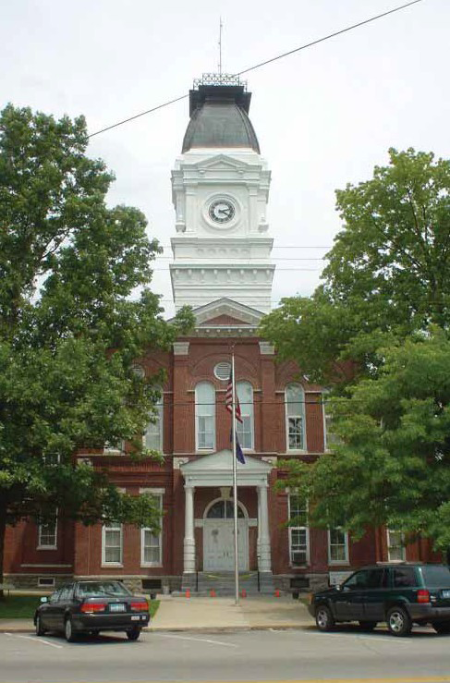 The input received from the public, Town officials, landowners and business owners was used to shape this new zoning code. It is our hope that this work will, over time, help the Clifton Park Town Center to evolve into a vibrant, attractive, mixed-use shopping destination for all to enjoy. Provide an easy-to-understand and predictable code through the use of illustrated building form standards and architectural guidelines which will create the desired types of development and streamline the review and approval process. Applicability. This code applies to all new development, renovations, redevelopment, changes of use and site plan approvals within the Town Center Zoning Districts, as identified on the Town of Clifton Park Zoning Map. Any building permit or site plan approval issued before the date of adoption, or subsequent amendment, of this chapter (reference § 208-97, Nonconforming land, structures and uses) shall remain in effect, except as noted below. Project approvals issued under this code shall expire if a building permit is not issued for such project within two years, or construction has not commenced within five years, of the date of approval. Applicants who have received project approvals prior to the date of adoption of this chapter may still choose to comply with this code voluntarily. Approval under this form-based code does not eliminate review requirement for construction plan submittals for a building permit per Town Code § 208-107 or other required permits or approvals. This code includes both standards which are required to be met, as well as guidelines which are encouraged, but not enforced. As such, provisions designated as "shall" or "will" are required, while provisions designated as "should" are encouraged. Planning Board authority to modify dimensional standards. 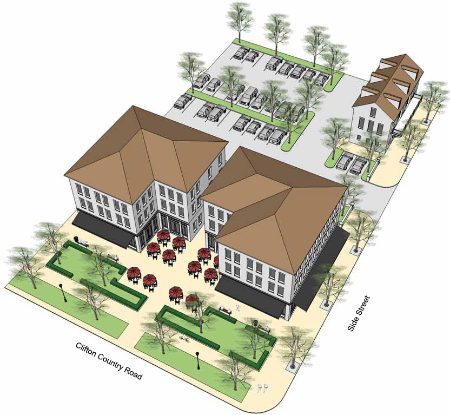 Allows for an improvement that will add to the overall vitality of the Town Center area and advances the purposes of this chapter of the Town Code. In the event of a conflict with this article and other sections of the Town Zoning Code the provision of this article shall apply. In the event of a conflict between diagrams or illustrations and the written text of this chapter, the written text shall apply. Should any provision of this chapter be declared illegal or unconstitutional by a court of competent jurisdiction to the extent that the other provisions of this chapter can be implemented without such illegal or unconstitutional provision, such other provisions shall remain in effect. Transit node of no more than two bus pull-off spaces or 10 automobile parking spaces. Further delegation by the Planning Board. In addition to administrative review and approval authorized above, the Planning Board may authorize the administrative review and approval of additional applications where such delegation of authority is permitted by law and is specified in writing in the Planning Board's Rules of Procedure with clearly specified thresholds and conditions under which the Planning Board classifies an application as eligible for administrative review. The thresholds and conditions shall be structured such that no new development shall be approved that results in a substantial adverse impact under any of the standards set forth in the bylaws. No amendment issued as an administrative review shall have the effect of substantively altering any of the findings of fact or Planning Board decision. Consent agenda. The Planning Board may require that administrative review applications be placed on a consent agenda at the next Planning Board meeting. As part of the consent agenda process, the Planning Board may review and modify the administrative review of the Planning Director or otherwise approve any items on the consent agenda as a group or individually. Administrative vs. design development review. Applications reviewed for compliance with this chapter may be either approved through administrative review or shall be approved through design development review (DDR). The purpose of administrative review is to streamline the approval process where possible for smaller or more-straightforward applications. The Planning Director is authorized to administratively review and approve all applications which clearly conform to all the applicable principles and standards of this chapter, or to deny approval if it does not conform. Applications which are denied may reapply after appropriate modification, and/or the applicant may request a full design development review instead. If the Planning Director determines that an application requires interpretation or discretionary judgment with respect to compliance with the standards and guidelines of this chapter, the application shall be referred to a Technical Advisory Committee (TAC), hereby established. The Technical Advisory Committee (TAC) shall consist of: the Chairperson (or Vice Chairperson) of the Planning Board, a Director of Building and Development, the Planning Director and the Planning Board Attorney. This review committee may be augmented as deemed necessary by the Planning Director with other Town officials and the Town-designated engineer (TDE) and Town-designated design professional (TDP) consulting firms. A checklist of required submission review materials necessary at the different stages of the review process is provided in the Appendix. Editor's Note: See 280-29, Appendix. Schematic conference. At the very early stages of concept design, prior to developing any detailed architectural/engineering drawings or filing a formal application, the applicant shall schedule an informal (preapplication) schematic conference with the Planning Director to discuss the general project intentions and review the code and it's procedures. The purpose of this conference is early detection of any potential design or other concerns before the applicant has expended time and funds on design and engineering plans which may require significant changes. A request for a schematic conference shall be accompanied by a very basic site schematic/layout plans and a copy of any additional information the applicant wishes to discuss. After the conference, the Planning Director will provide to the applicant a preliminary list of recommendations related to the development plans, such as: variances or permits required; initial design feedback; guidance on which types of technical studies may be necessary; and identification of any TDE/TDP review that might be necessary before approvals can be granted. If it is determined that the application would qualify for administrative review as submitted, or with only minor modifications, the Planning Director shall inform the applicant, within 30 days, of what additional steps, changes, forms and fees would be required to submit a formal application. Once submitted, the formal application may be approved, approved with modifications or denied as part of administrative review. Other applications shall proceed to the concept development meeting. Concept development meeting. After the schematic conference, the applicant shall prepare additionally revised design plans, including any suggested modifications, required studies and information requested in the previous meeting. Once prepared, the applicant shall submit these materials to schedule an informal concept development meeting with the TAC. If it was determined that an escrow account should be established to cover the review fees by private consulting TDE or TDP firms, such account shall be set up and funded by the applicant prior to the meeting. The TAC, including any additional review members deemed necessary by the Planning Director, shall review and discuss the proposed project at the meeting with the applicant. The purpose of this meeting is early detection of any potential design concerns before the applicant has expended significant time and funds on final design and engineering for full Planning Board review. 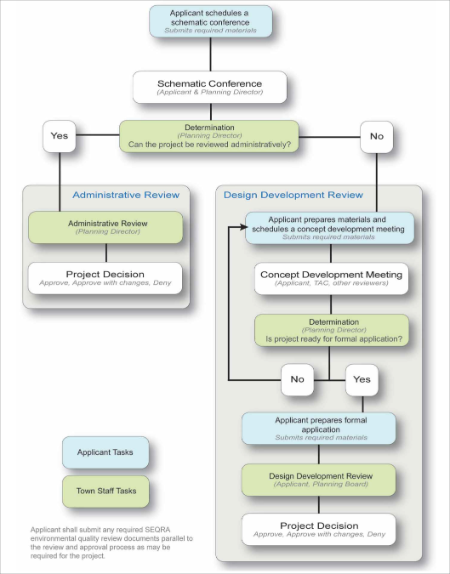 After the concept development meeting, the Planning Director will provide to the applicant a nonbinding list of recommendations related to the design plans and meeting discussion, follow up with the TDE/TDP as/if required, as well as identify if the application is ready to proceed to formal design development review and the next steps in the review and approval process. Formal application and design development meeting. Formal applications for design development review shall be submitted to the Planning Director along with any required plans, forms, fees and studies. Any required variances or special use permits shall be obtained prior to or in parallel with the formal application process. The Planning Director shall refer a copy of the application to the Saratoga County Planning Board for review under New York General Municipal Law 239-m for projects that cause a physical change in access to a state or county highway. Applications shall be reviewed for completeness. The Planning Office will notify the applicant if his/her/its application is complete or not and identify any missing information which must still be submitted. The applicant must submit the requested information within 60 days of notification or the application will be deemed withdrawn, forfeiting any application fees. Complete applications will be forwarded to the appropriate Town departments or review consultants to verify consistency with this chapter. The Planning Board shall approve, approve with modifications, or deny the application within 60 days from submission/completion of the SEQR process, in writing to the applicant, detailing the findings/determinations for its decision. Public hearing. A public hearing shall be required for any project that is categorized as a Type 1 action pursuant to the New York State Environmental Quality Review Act and its implementing regulations prior to final decision by the Planning Board on a design development review. The Planning Board may but is not otherwise obligated to require a project that is not a Type 1 action to have a public hearing. The location and extent of public/open space. The location of future new roads, service alleys, multi-use paths, transit stops and recommended tower designs. The location and boundaries of each development zone TC1 thru TC6, and the Design Overlay. The general location or orientation of required storefronts, where they provide direct facade frontage along a public or private street. TC6 - Boulevard. The Boulevard Zone is intended to define the character of the primary boulevard through the Town Center. 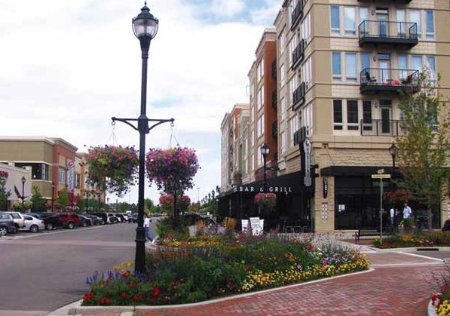 This boulevard is designed to showcase the large lawns, shade trees, planted medians and a multi-use path as a "parklike" setting, fronted on either side by continuous shopfronts, sidewalks and outdoor patios. Bisecting Route 146 with gateway median designs and architectural tower elements, it seeks to attract visitors into the Town Center neighborhood. 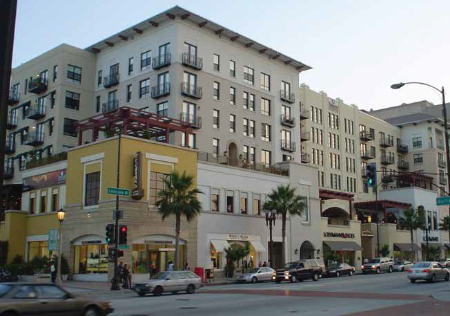 Mixed-use buildings up to five stories, with residential dwelling units only permitted above commercial space. TC5 - Neighborhood. 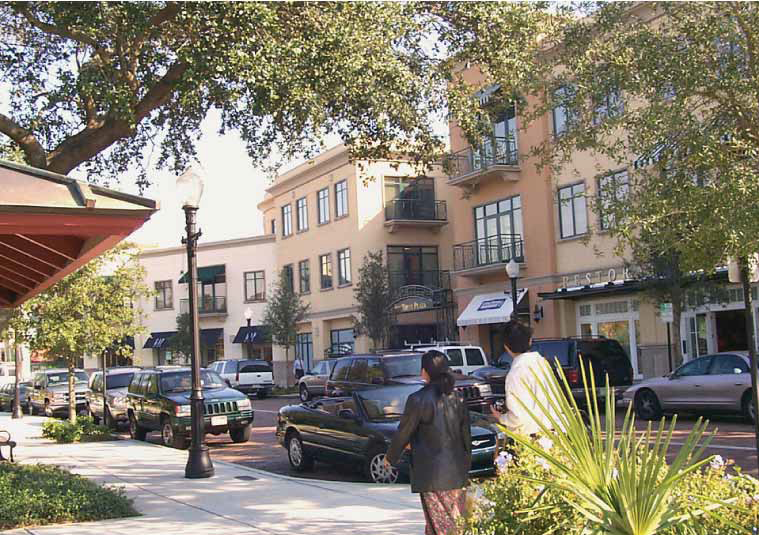 The Town Center Neighborhood Zone is intended to be the core pedestrian shopping area and mixed-use neighborhood. A network of side streets with wide sidewalks, street trees and commercial shopfronts served by on-street parking, hidden parking lots and garages tucked within the center of the blocks. 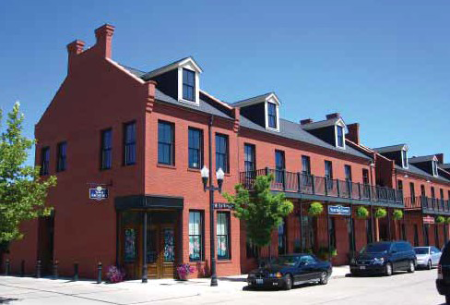 Three-story mixed-use buildings, with residential dwelling units only permitted above commercial space. Provides incentives to permit up to five-story buildings in return for providing structured parking. TC4 - Transition. The Transition Zone is intended to create a transitional zone to outlying areas of the Town Center and neighboring residential areas. Three-story buildings with primarily commercial office uses, with some limited retail and residential uses. TC3 - General. 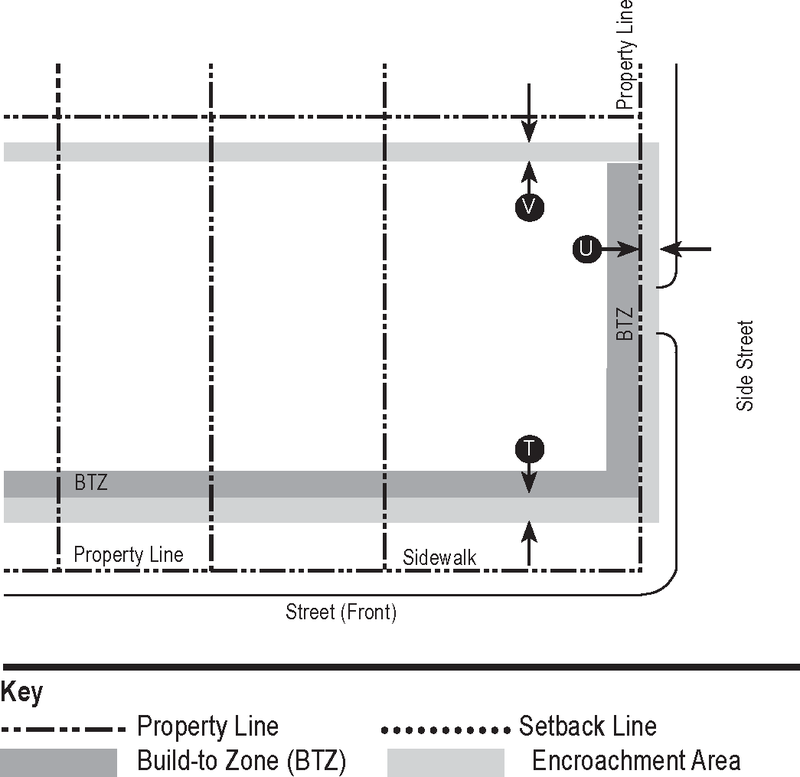 The General Zone is intended to allow for more suburban lot configurations of commercial and office uses along the Route 146 corridor which would not be suitable for the central neighborhood portions. Three-story buildings. TC2 - Edge. The Edge Zone is intended to create a transitional zone between the central commercial districts and the outlying residential areas with lower-intensity development and shorter building heights. Three-story buildings, primarily residential in nature, but does allow for some limited supporting commercial uses as part of the development. TC1 - Highway. 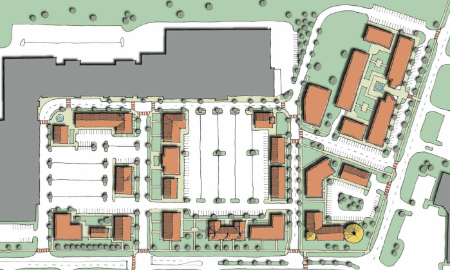 The Highway Zone is intended to allow for more suburban lot configurations of commercial and office uses along the Northway corridor which would not be suitable for the central neighborhood portions. Emphasis is placed on providing attractive architecture which will be viewed from both the front and the back, with increased tree buffers, landscaping and architectural standards along the Northway frontage to maintain an attractive presence along the highway. OS - Open Space. The Open Space Zone represents the goal of providing attractive landscaped or natural areas with trees, landscaping and buffers where possible which will enhance the overall visual appeal of the Town Center for the benefit of everyone. This zone is intended to suggest and promote areas for small parks, trails, open lawns, watershed management and recreational areas for the future use and enjoyment of shoppers and residents. This zone is not intended to require any specific property to be set aside as open space. Green lawns, shade trees, playgrounds, picnic areas, multi-use paths and attractive landscaping are to be considered as goals and determined on a project basis during development review. Once designated on an approved plan, no commercial or residential uses are permitted. The Open Space Zone boundaries are representational of the amount and general location of open space, buffer or amenity area to be set aside from a Master Plan perspective. The actual location, extent, design, level of improvement and management (public, private, nonprofit) shall be determined as part of the design development review for the parcel(s). DO - Design Overlay. 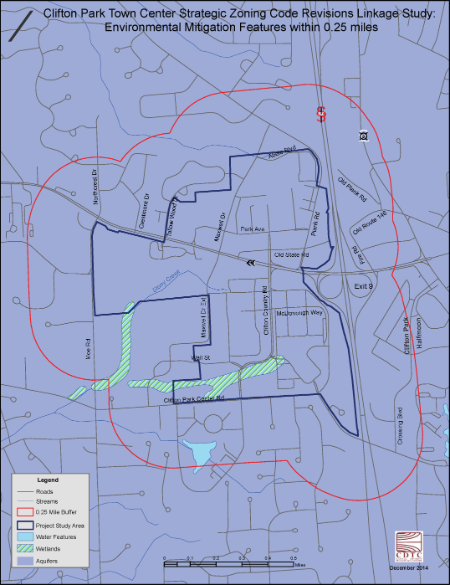 The Design Overlay is an overlay district to address areas outside of the original Town Center Master Plan that are logical extensions of the Town Center area but which have not been master-planned. Development projects in this area are required to go through the full design development review process in order to ensure proper development. A collaborative design development review process under the Design Overlay shall include the property owner(s)/contract vendee, the Town Technical Advisory Committee, the Town-designated engineer, and the Town-designated design professional to determine how to best advance the recommendations of the Clifton Park Town Center Master Plan and the project development plan. The permitted uses of the underlying zoning districts may be modified through the planned development district process pursuant to the objectives of Article XI, Planned Development Districts. This collaborative process shall include consideration for connecting Moe Road to Maxwell Road Extension, multi-use pathway connections to Moe Road, Collins Park and to the Clifton Park-Halfmoon Library and set aside of approximately 30% of the property as public open or civic space, which may include multipurpose paths, connector roads, green infrastructure/stormwater management areas, and pocket parks and greens. The underlying zone designation per the Regulating Plan will not become effective until conclusion of the full design development review process. The allowable uses in each development zone are as set forth in Table 3-1, Allowed Uses. Uses not listed, or blank cells, indicate use not permitted. Some not-permitted uses are still listed in order to avoid ambiguity with similar functions. See 280-22, Subsection 5, for special permit use considerations. Bank, drive-thru. 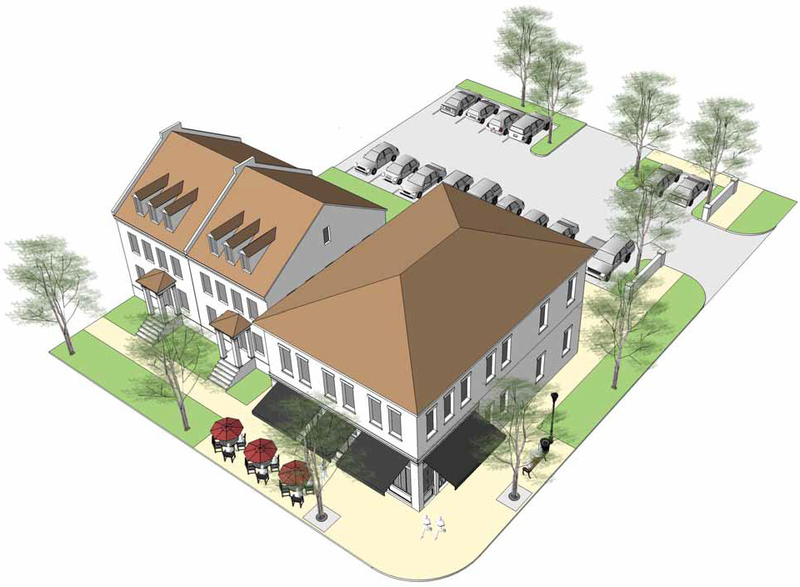 Bank drive-thrus, including drive-up ATMs and freestanding kiosks, shall be located at the rear of the building and screened from view as directed by the Planning Board. Drive-thru facilities are encouraged to utilize one curb cut where possible. The applicant shall provide an affidavit setting forth the scope of operations proposed and demonstrate that there will be no noise, odor, smoke, glare or vibration beyond the property line. The Planning Board shall make appropriate findings with respect to location, intensity of use, parking and any other factors that may affect neighboring properties and may require specific performance standards to limit impacts to adjacent properties with regard to air quality, noise, visual impact, emissions, and other reasonable concerns that may be applicable to the use. There shall be no more than one home occupation per residential building, and no more than two employees may be permitted. The use, including related storage, may occupy no more than 25% of the habitable floor area of the existing principal residence or no more than 500 square feet in the principal residence. The home occupation shall not involve the outdoor display of any materials or goods. The home occupation shall not involve the on-site use or storage of any commercial vehicles or construction equipment or mechanical equipment except for one vehicle not over 6,000 pounds. Personal care. Personal care services are permitted in the TC2 Zone by special permit as an accessory use, provided that all such establishments are limited to no more than 1,500 square feet of gross floor area or 10% of the total building footprint area, whichever is greater. Retail. 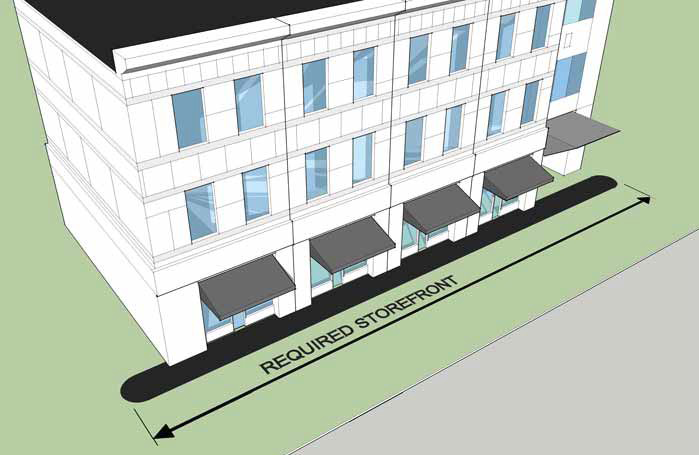 Retail uses are permitted in the TC2 Zone by special permit as an accessory use, provided that all such establishments are limited to no more than 2,000 square feet of gross floor area or 10% of the total building footprint area, whichever is greater. Retail, drive-thru. Retail establishments with drive-thru services shall locate such service at the rear of the building and screened from view as directed by the Planning Board. Drive-thru facilities are encouraged to utilize one curb cut where possible. Retail, outdoor display. The outdoor display or storage of retail merchandise shall be limited to business hours. The display of motorized vehicles or equipment, such as lawnmowers, snowblowers, ATVs, snowmobiles and similar items, is not permitted in the TC6 Zone. Restaurant, drive-thru. Restaurant establishments with drive-thru services shall locate such service at the rear of the building and screened from view as directed by the Planning Board. Drive-thru facilities are encouraged to utilize one curb cut where possible. A minimum of 40% of the exterior surface area of the garage facades facing a public way or sidewalk shall be clad in materials such as brick, stone, green-wall (e.g., ivy), decorative metalwork, wood trim or other materials as approved by the Planning Board in lieu of bare structural concrete or masonry, to present an attractive appearance. In addition to any other perimeter landscaping used or required, trees shall be planted at regular intervals to align with openings in the structure along facades facing a public street or highway. All parking and security lighting shall be provided from fully shielded, downward-facing lamps which direct the light only into the immediate parking areas as required for use. The allowable base residential density within the Town Center shall not exceed 10 dwelling units per acre, exclusive of undevelopable lands, up to a maximum of 50 dwelling units per project. 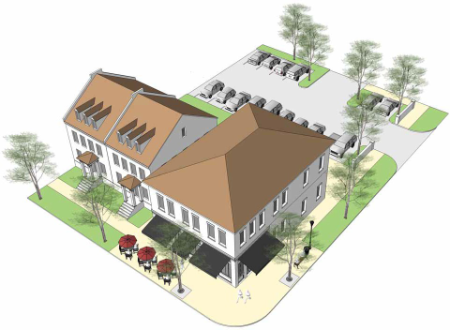 Additional residential density above the allowable base levels may be permitted, with Town Board approval, provided the applicant provides for the design and/or construction of additional amenities within the Town Center for the use and enjoyment of the general public. The amenities shall include provisions for on-site and/or off-site improvements beyond those required to service the needs of the subject project. A parking garage or deck, where not less than 50% of the parking spaces provided are available to the public (minimum 100 spaces). Recreational areas such as a public park or playground, maintained by the applicant, which is designed as an integral part of the development, readily visible and accessible from the public way, not less than 1/4 acre in size. Residential housing facilities for persons of low to moderate income. A stormwater retention or detention pond which captures or mitigates local stormwaters within or from the Town Center boundaries. A reduction in overall impervious surface area on the site, resulting in a substantive decrease in stormwater runoff. Payment of funds provided to the Town in lieu of or in combination with proposed amenities of a sum to be determined by the Town Board, which shall be deposited in a fund exclusively for community benefits or improvements within the Town Center. The public amenities proposed must be commensurate, in the judgment of the Town Board, with the requested density increase before they may be approved. Consideration may be based on each additional residential unit above the base density per 3,000 square feet of improvements, or other criteria the Town Board may establish in a separate amenity schedule which outlines equivalent reimbursements. Any structured parking provided within the footprint of the building but less than six feet above grade shall not be counted against the limits for overall building height or number of stories. 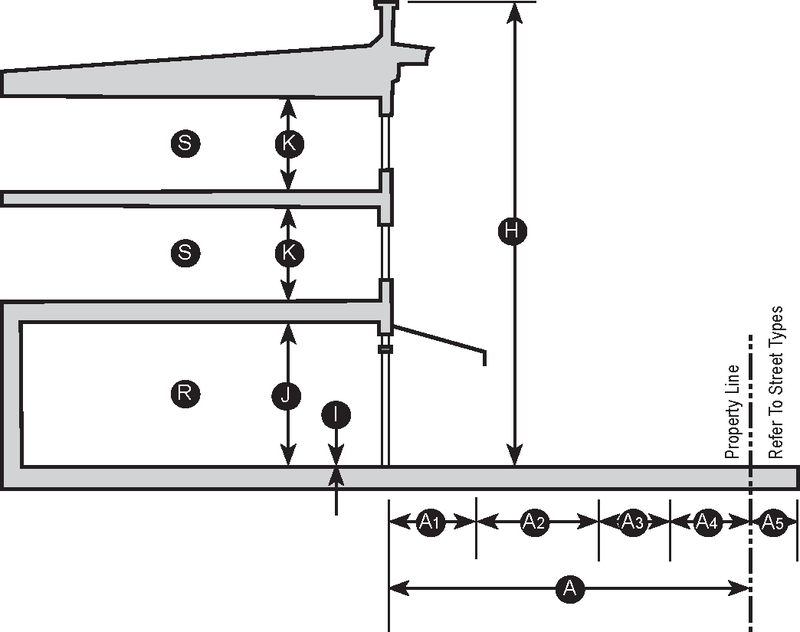 Figure 3-1. Build-To Line. Both road frontage facades shall be placed at the required build-to line. Build-to line. The specific location on the property where the facade of the building must be placed, measured as a distance from the property line / public right-of-way (ROW). The amount of facade which must be placed along this line is explained as the frontage width percentage. Figure 3-2. Build-To Zone. 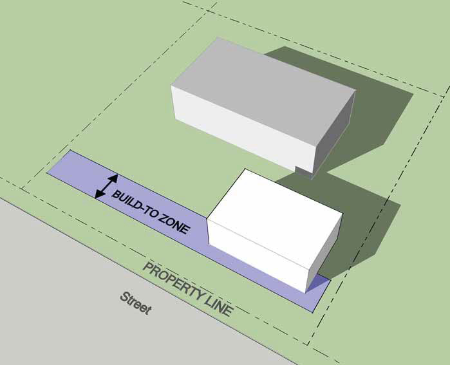 Both road frontage facades shall be placed within the build-to zone, which has a minimum and maximum distance from the property line. Build-to zone. Similar to the build-to line, this is a flexible area where the facade of a building must be located, measured as both a minimum and maximum setback distance from the property line / public right-of-way. The amount of facade which must be placed inside this zone is explained by the frontage width percentage. Figure 3.3. Frontage Width Percentage. The facade at the required build-to location is encouraged to meet the a minimum width where possible, expressed as a percentage of the total lot width. Frontage width percentage. 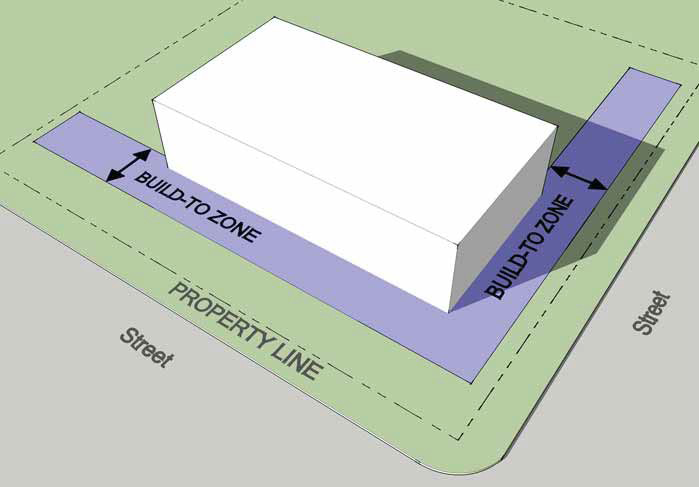 The recommended minimum percentage of the lot width which should be occupied by building facade along the build-to line or within the build-to zone. 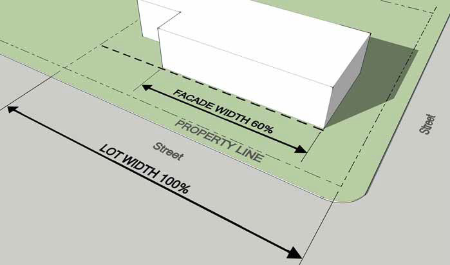 For example, a property which is 100 feet wide with a frontage width percentage of 60% should try to provide at least 60 feet of facade length in the build-to zone, where possible. 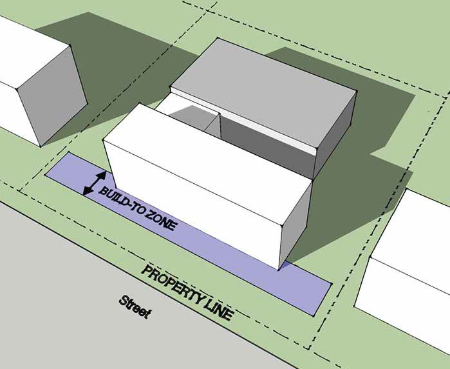 Any additional length of front facade would be allowed to step back further from the street, if desired. The intent of this guideline is to encourage development to maximize the front facade exposure along the street where possible. Figure 3.4. Corner Lots. Buildings located at corner intersections must locate at least the first 30 feet of each facade frontage at the build-to line or zone. The purpose of this provision is to anchor the corners of the blocks with strong building elements. Corner lots. Buildings on corner lots defined by a build-to line or zone must locate both facades within the line or zone, extending a minimum of 30 feet in each direction from that corner of the building. Figure 3.5. Setbacks. 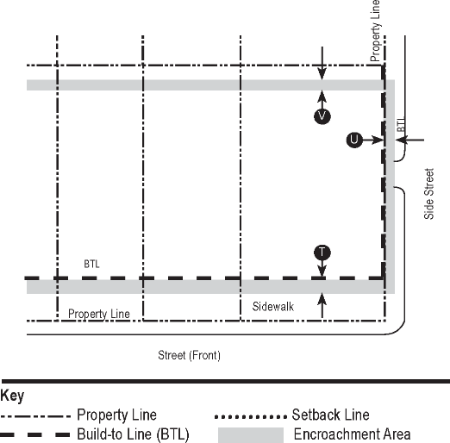 The building facade can be placed anywhere behind a noted setback line. Similar setback lines may apply specifically to parking areas. Setbacks. 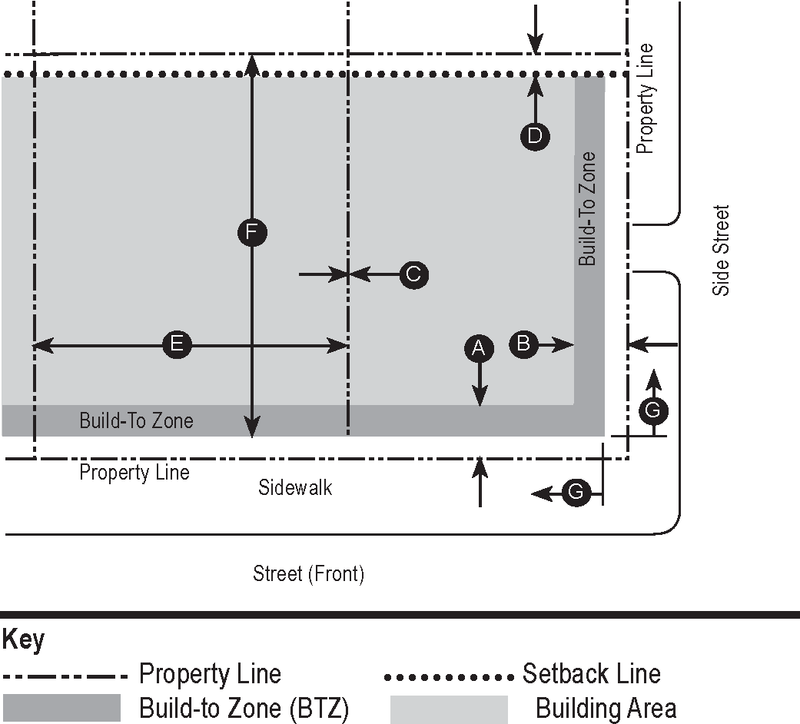 The minimum distance a building facade or parking area must be located from a property line or public right-of-way; similar to a build-to line or build to zone, except the building or parking can be located anywhere behind that line. Figure 3.6. Building Height. 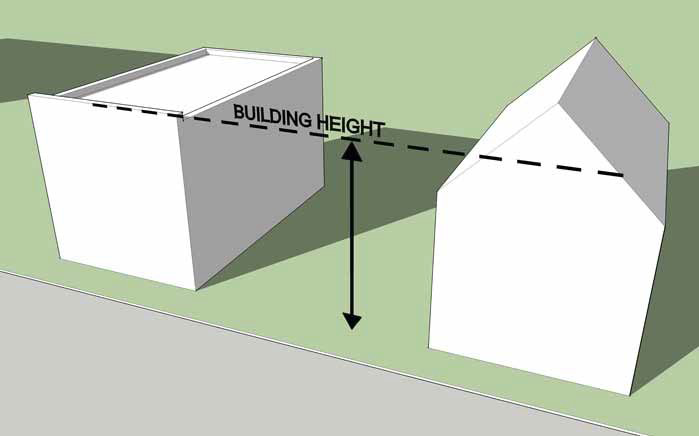 Building height is calculated differently for flat-roof structures than for pitched-roof structures. The calculated height of pitched-roof structures is measured to a point halfway up the slope of the roof. Building height. Building height is measured from the average front facade grade level to the mean height between the eaves and the roof peak (for sloped-roof structures) and to the top of the parapet (for flat-roof structures). Facade transparency. The amount of window glass or other openings in the facade of a building, relative to the overall surface area of the facade. Ground-level pedestrian areas - particularly required shopfront areas - are required to have the highest levels of facade transparency, typically around 70% or more. Figure 3.7. Facade Transparency. Facade transparency is a measure of the relative percentage of transparent window area compared to the amount of overall opaque facade area. Facade transparency is measured separately for the ground-floor levels and upper-floor levels. The ground-floor area is measured between two feet above the ground to 12 feet above the ground. Upper-floor areas are measured between 12 feet above the ground and the roof. Figure 3.8. Required Storefront. 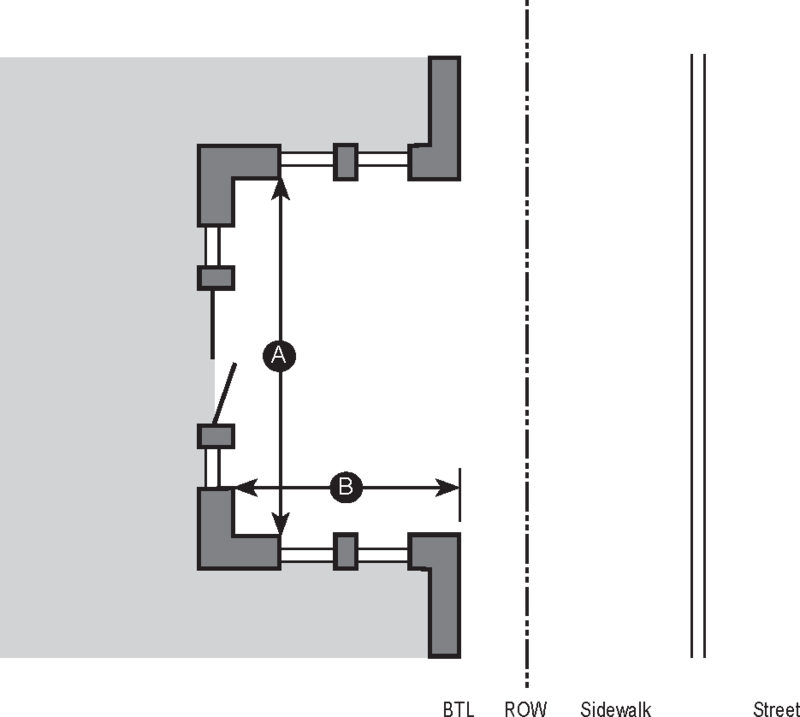 Areas on the Regulating Plan which are shown with a heavy black line are required to have ground-floor storefront windows and meet certain facade transparency requirements. Required storefront. Areas indicated on the Regulating Plan for required storefront must meet minimum facade transparency requirements as well as include ground-floor shopfront windows to create an active and inviting pedestrian environment. Understanding that much of the Clifton Park Town Center has already been developed, much of the future change will be occurring on properties which already have nonconforming structures on them. As they expand or renovate, it may not always be economically feasible or practical for them to fully meet the specific build-to requirements of this code. In such cases where small additions or expansion plans would otherwise fall short of full compliance of the minimum setback requirements, the Planning Board is authorized to limit or waive the dimensional requirements, provided that it is in keeping with the overall goals and intent of this code. (See description in 280-21, Subsection 3.) To illustrate how this is intended to work, the following examples are provided as a guide toward the intent and desire of this code to deal with such incremental change as the Town Center evolves over time. Example. 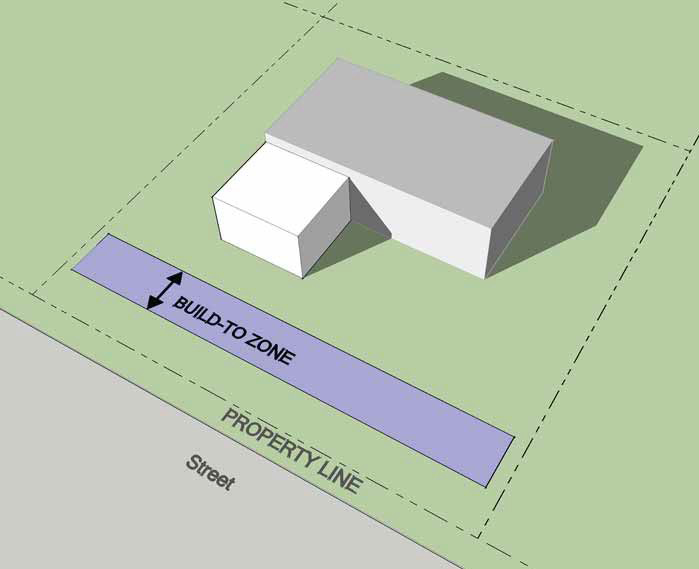 An existing building is located near the rear of the property, far away from the build-to zone (or build-to line) required for the property. The building owner seeks to build a small addition to this building; however the addition he/she/it seets to build would not be large enough to reach all the way up to the required build-to zone near the front of the lot. Figure 3.9. OPTION ONE - ACCEPTABLE. An existing building, set far back from the required build-to zone (BTZ) places a small addition on the side of the building. Although the addition does not comply with the zoning by providing front facade within the build-to zone, this solution may be acceptable because it has not increased the nonconformity of the existing building. Option One. The new addition is built off the side of the existing building (Figure 3.9). 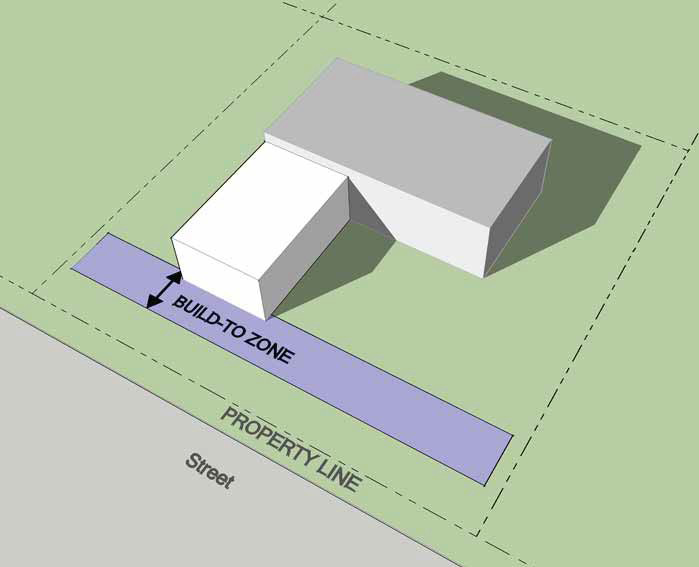 Even though the addition does not comply with the zoning by placing its front facade within the required build-to zone, this solution is an acceptable compromise because it does not increase the nonconformity of the original structure. Figure 3.10. OPTION TWO, ACCEPTABLE (BETTER). Instead of placing the addition on the side of the existing building, the new addition is placed on the front, extending closer to the build-to-zone. 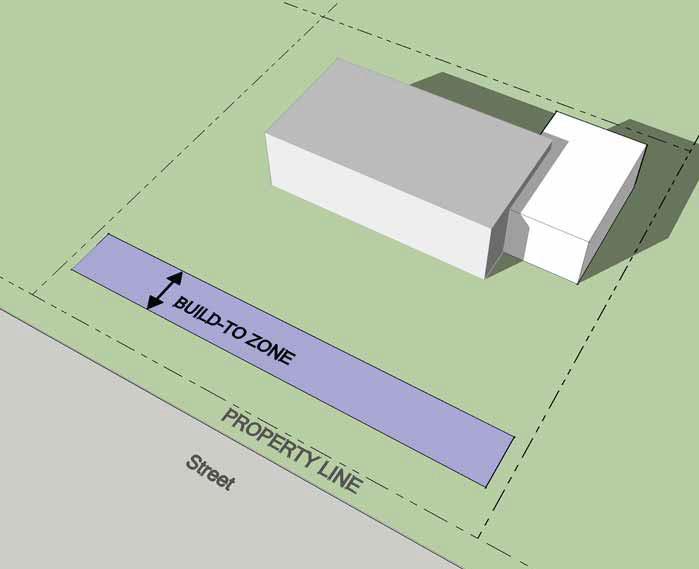 Although this addition does not fully comply with the zoning by providing front facade within the build-to zone, it is acceptable because it has reduced the nonconformity of the existing building. Option Two. 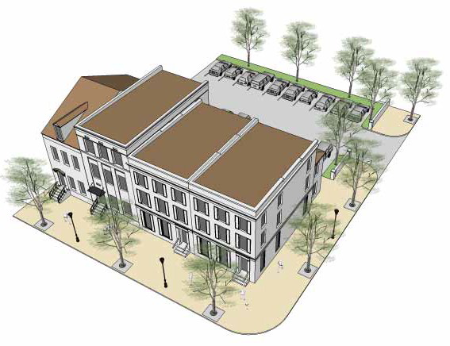 The new addition is built off the front of the existing building, extending the front facade closer to the required build-to zone to the extent possible and practical (Figure 3.10). Even though the addition does not comply with the zoning by placing its front facade within the required build-to zone, this solution is acceptable because it decreases the nonconformity of the original structure. This solution is preferable to the previous one. Figure 3.11. OPTION THREE (PREFERRED). 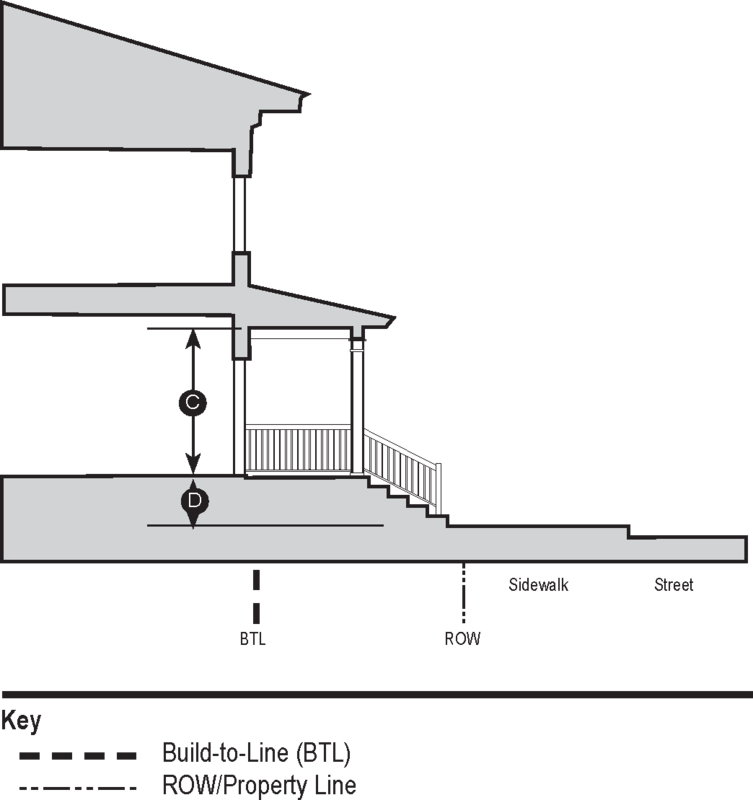 The front addition extends all the way up to the required build-to zone (BTZ), which is preferred because it has reduced the nonconformity of the building and placed storefront facade up at the desired setback distance. Option Three. 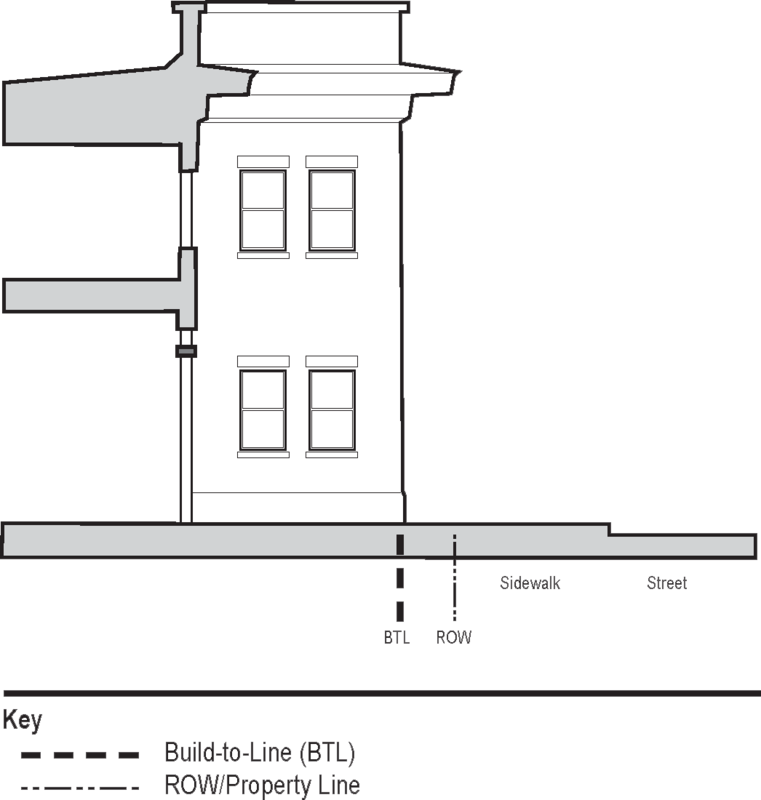 The new addition is built off the front of the existing building, extending all the way up to the required build-to zone (Figure 3.11). 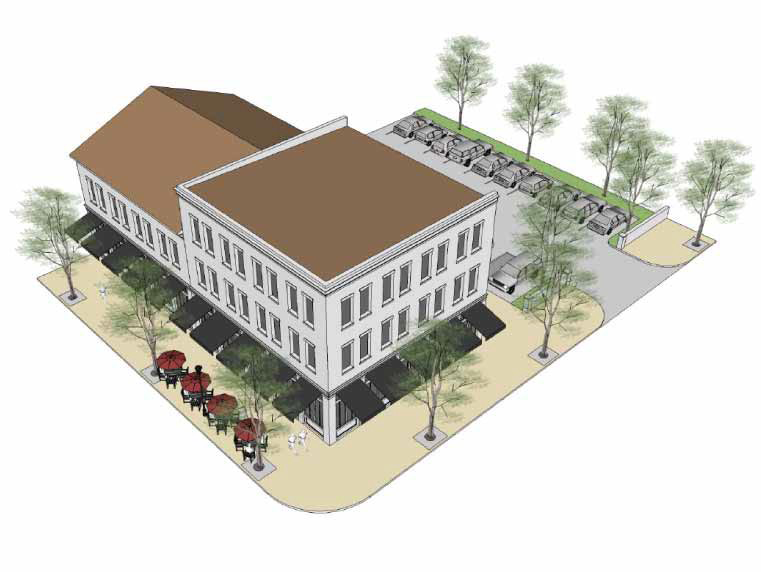 This solution is preferable to the previous two because it reduces the nonconformity of the original structure and provides storefront facade up near the street and public sidewalk. Figure 3.12. OPTION FOUR, PREFERRED. A new building is placed at the front of the lot within required build-to zone (BTZ), which is also preferred because it has reduced the nonconformity of the building and provided more facade along the streetscape. Option Four. A new building is constructed on the lot with the front facade within the build-to zone (Figure 3.12). 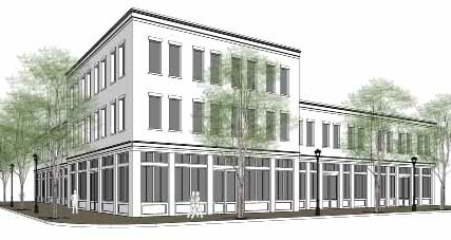 This alternative is also preferred over the previous two options because the new building conforms to the zoning and it provides even more new storefront up close to the street and sidewalk. Figure 3.13. OPTION FIVE (NOT ACCEPTABLE). The new building addition is placed at the rear or side of the existing building. This is not preferred because it increases the nonconformity of the building. Option Five. The new addition is constructed in the rear of the existing building (Figure 3.13). This solution is not acceptable because it increases the nonconformity of the original building and does not attempt to advance the concepts of the code. Figure 3.14. OPTION TWO (FUTURE EXPANSION). 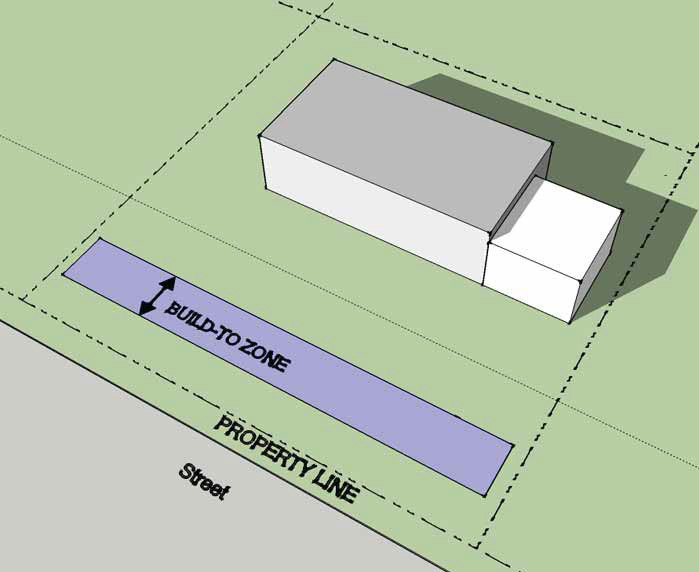 Over time, the small addition shown in Option Two can be further expanded to create a much larger facade presence along the build-to-zone, which begins to set up a consistent pattern with the new development on either side of the property. Option Two - Future Expansion. Over time, as the Town Center slowly evolves with incremental changes, the small addition could be further expanded to provide more commercial space with additional facade frontage within the build-to zone (Figure 3.14). 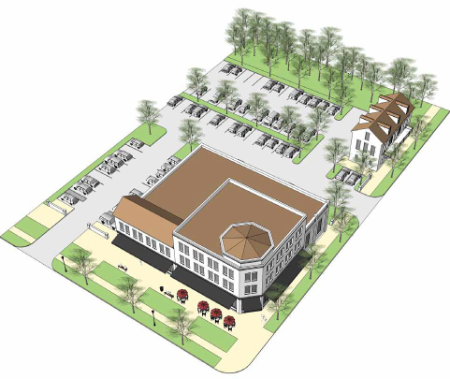 The new building would be in keeping with the original design intent and would be consistent with new development on the neighboring properties, creating the desired effect of the Town Center design. Figure 3.15. OPTION TWO (FUTURE BUILDOUT). 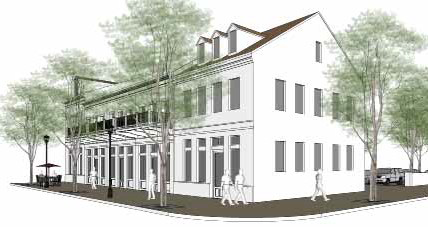 Eventually, the property could be redeveloped, where the original nonconforming structure is removed and replaced with a larger, new building which fully conforms to the code. Option Two - Future Build-Out. Eventually, the original building on the property could be removed and replaced with new facilities which provide even more commercial space (Figure 3.15). All structures on the property would then be in conformance with the code. The primary intent of this zone is to create an attractive entrance and boulevard route into and through the Town Center neighborhood, as a transition from the larger Route 146 to the smaller side streets. Along Clifton Country Road, a revitalized streetscape of trees, decorative lighting, landscaped multi-use path and sidewalks will be framed by inviting and attractive architecture. Existing front parking lots will gradually be transformed into attractive community and economic amenities, from outdoor patios and cafes to well-designed and interesting facades, where each building offers an attractive and inviting view of the ground-floor activities within. From storefront window displays, to outdoor dining areas amidst beautiful landscaping, as one travels from building to building and business to business, there is a continual offering of design elements to engage one's interest. 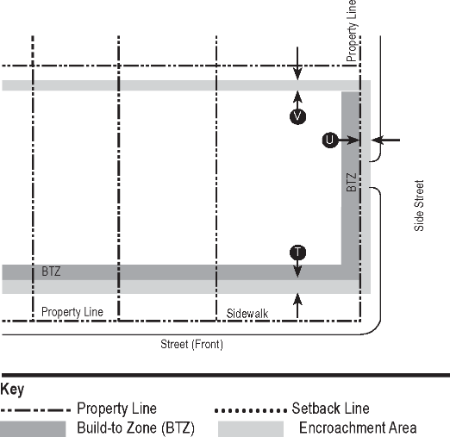 Illustrative example of buildings and site arrangements in the TC6 Boulevard Zone. 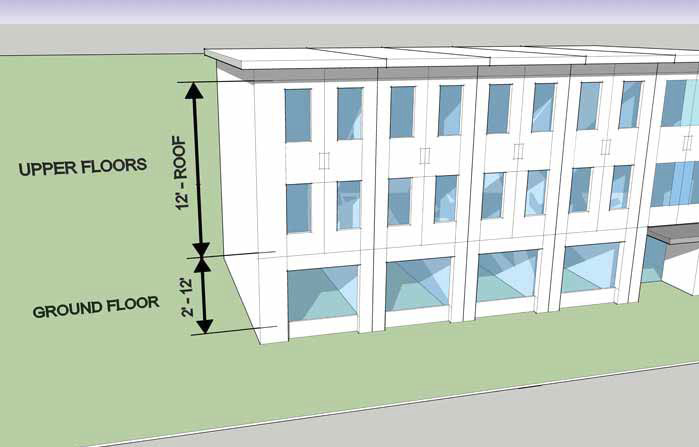 Corner Properties: Both street facades must be built to the BTL for the first 30' from the corner of the building. Main Building, 40' min. ; Ancillary Building, 20' min. 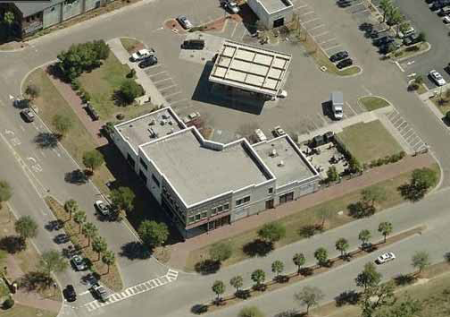 No parking spaces are required for Ancillary Buildings that are < 500 sf. Parking must be provided on-site, off-site within 1,300', or as part of a district-wide parking management strategy. 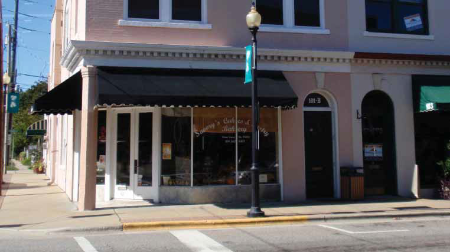 Balconies, Bay Windows, Awnings, etc. 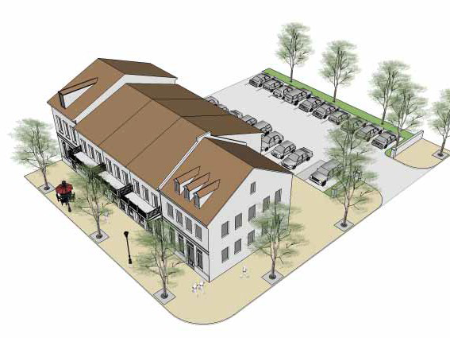 Only one Main Building and one Ancillary Building may be built on each lot. Where a building facade steps back or is absent from the BTL, the BTL should be maintained and defined by fence, landscape wall or hedge 30"-54" high. All buildings must have a primary entrance along the front facade. Loading docks, overhead doors and other service entries shall not be located on street-facing facades. A clear, designated pedestrian way(s) shall be provided from parking areas. Building entrance from parking areas shall provide attractive, welcoming architectural entry treatments. The primary intent of this zone is to become the core pedestrian shopping area and mixed-use neighborhood of the Town Center. Priority is placed here on optimizing the physical characteristics of the built environment for increased walkability. While much of the land encompassed by this district was originally built in an automobile-dominant format, the intent is to facilitate a transition of individual parcels over time, each adding up to a vibrant, walkable Town Center. Characterized by a network of side streets and service alleys, providing wide sidewalks, street trees and commercial shopfronts served by on-street parking, with parking lots and garages hidden within the center of the blocks where possible. To maximize vibrancy and walkability, this zone features buildings located close to the sidewalk, plentiful shade for pedestrians, and parking lots screened from view. Three-story mixed-use buildings are permitted, with residential dwelling units only allowed above commercial spaces. Retail shopfronts are required along the ground-floor level of most areas. This zone also allows for buildings up to four or five stories in height in return for providing structured parking which is available to the public. 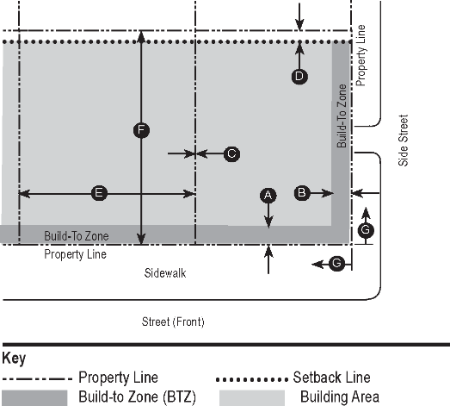 Illustrative example of buildings and site arrangements in the TC5 Neighborhood Zone. Corner Properties: Both street facades must be built in the build-to zone for the first 30' from the corner of the building. 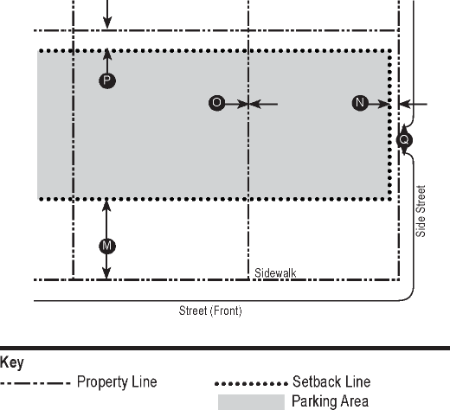 14-5 story heights may be permitted with structured parking, see Structured Parking Incentive, § 208-22, Subsection 7. Where a building facade steps back or is absent from the BTZ, the BTZ line should be maintained and defined by fence, landscape wall or hedge 30"-54" high. The primary intent of this zone is to provide a commercial area which acts as a transition to the surrounding residential neighborhoods around the Town Center. Characterized by three-story buildings, this zone primarily allows office uses, with some mixed-use residential and limited retail uses, in order to limit the potential impact on the nearby residences. Among other adjusted details, buildings here are set slightly further back and heights are somewhat lower than those in the TC5 Neighborhood District. 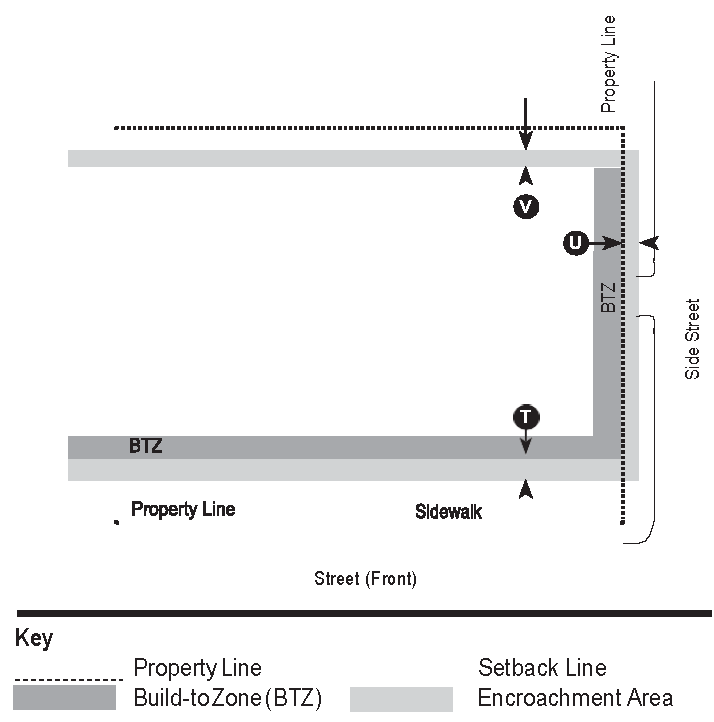 Illustrative example of buildings and site arrangements in the TC4 Transition Zone. Comm. 6" max., Res. 24" min. The primary intent of this zone is to provide a general commercial area along the Route 146 corridor which primarily serves vehicular traffic and heavy vehicular uses. 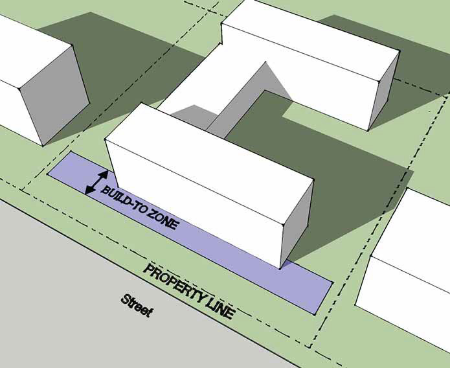 This zone allows for more suburban-oriented lot configurations and uses which would not be suitable for the central neighborhood portions of the Town Center. Building heights are capped at three stories. Residential uses are not permitted. 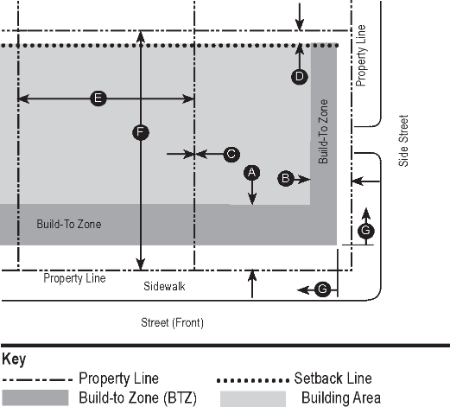 Illustrative example of buildings and site arrangements in the TC3 General Zone. 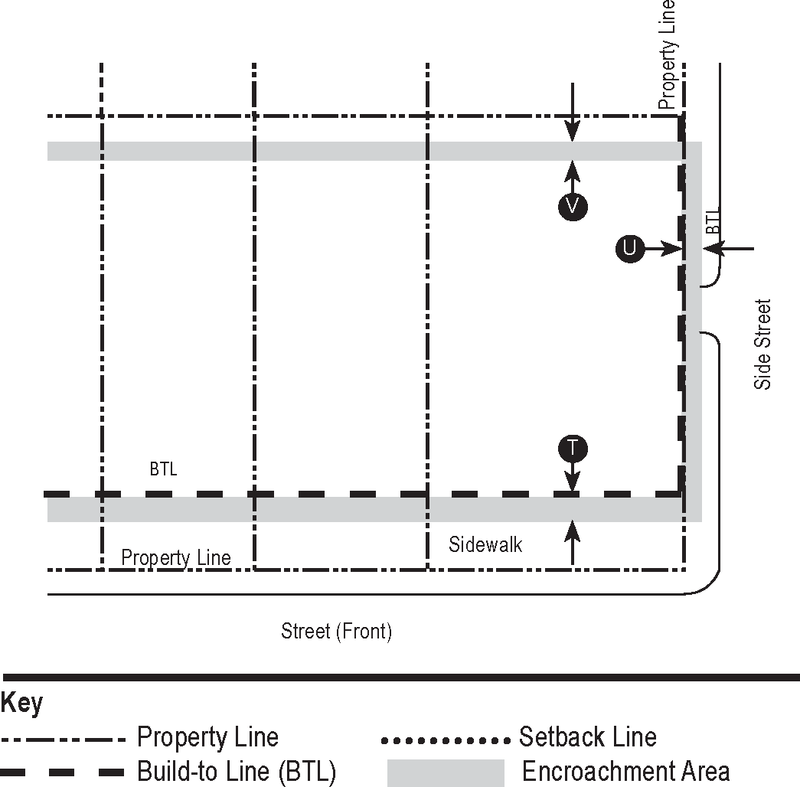 Street Facades must be built to the BTL for the first 30' from the corner of the property line. 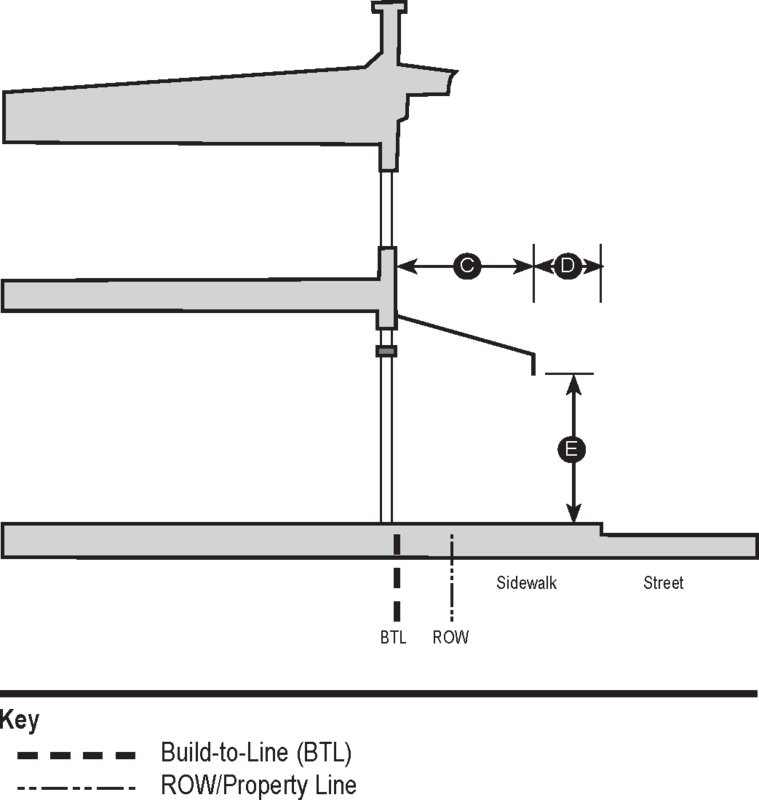 Where a building facade steps' back or is absent from the BTZ, the BTZ line should be maintained and defined by fence, landscape wall or hedge 30"-54" high. The primary intent of this zone is to provide a buffer to the residential neighborhoods on the outskirts of the Town Center. This zone allows three-story buildings, primarily residential in nature, but does permit some limited supporting commercial uses as part of the development. 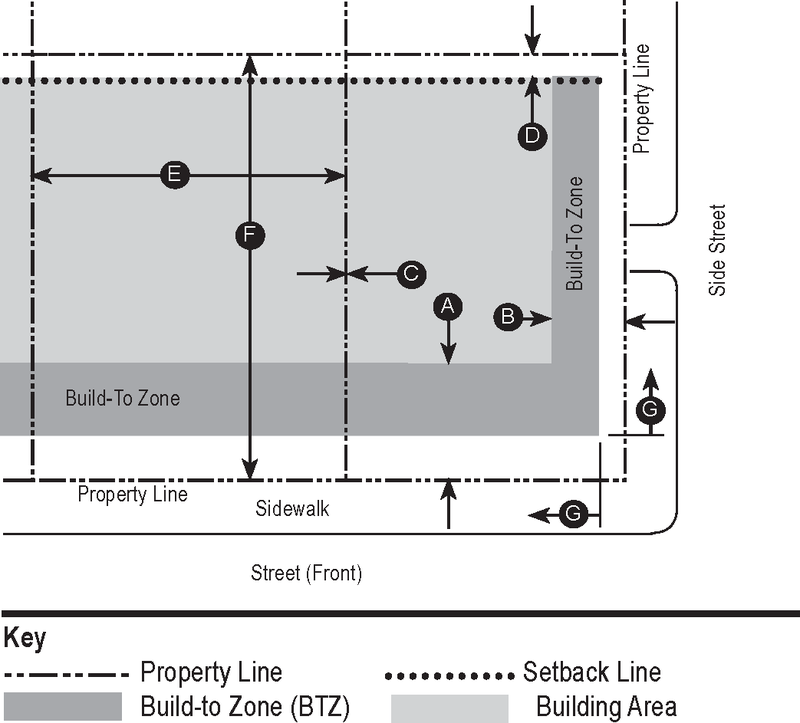 Illustrative example of buildings and site arrangements in the TC2 Edge Zone. The primary intent of this zone is to facilitate autooriented highway commercial development along the Northway corridor which would be suitably viewed from both the front and rear, providing an attractive first impression of Clifton Park for those travelling along 1-87. This zone allows for more suburban lot configurations and uses which would not be suitable in the central neighborhood zones, however emphasis is placed on increased landscaping and tree buffers and additional architectural standards along the Northway frontage to maintain an attractive presence along the Northway. Service areas of buildings are screened from view from the highway architecturally and/or with landscaping. Illustrative example of buildings and site arrangements in the TC1 Highway Zone. 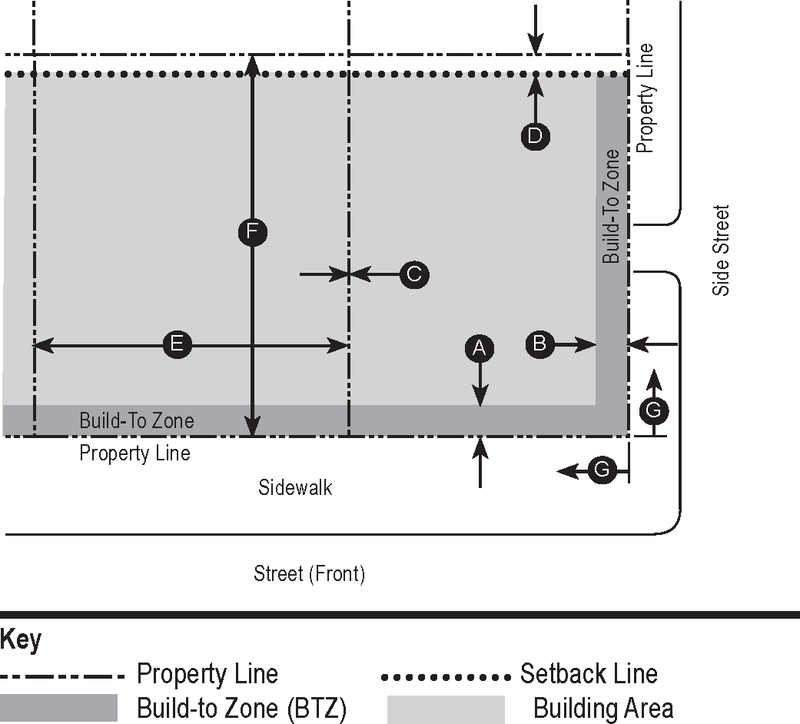 Street Facades must be built in the BTZ for the first 30' from the corner of the property line. Loading docks, overhead doors, outdoor storage and other service areas shall be screened from view from 1-87 architecturally and/or with a thickly planted buffer of trees. All streets within the Town Center shall be constructed with the sidewalks, street trees, medians, amenities, on-street parking and other elements as illustrated for their corresponding street type on the Future Streets Map. 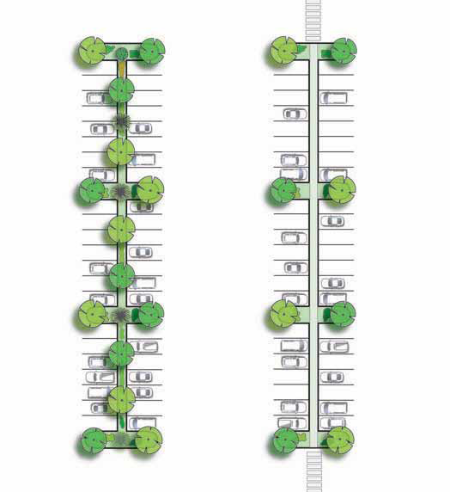 Dimensional flexibility is permitted for street types to account for varying ROW widths; however, they should be designed to have all the basic functional characteristics, including roadway width, on-street parking, sidewalks, multi-use paths, street trees and landscaped areas shown for their type. 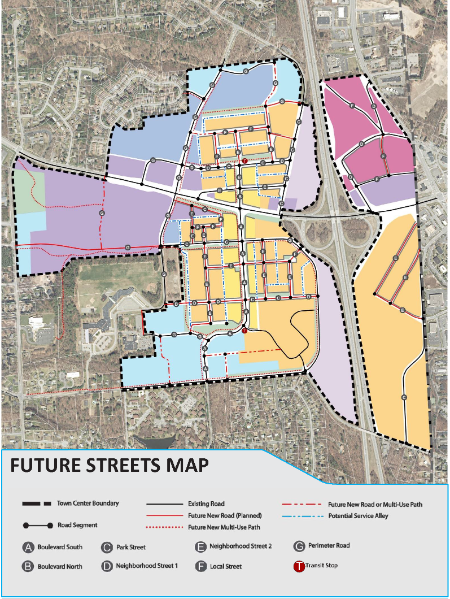 The existing and future roads indicated on the Future Streets Map are intended as a general guide to the desired future street connections within the Town Center. To provide for maximum design creativity and flexibility, the elements shown are intended as a suggested design outcome only and should not be interpreted literally or be strictly required. Actual configuration of any new public or private streets shall be subject to an agreement to dedicate roads consistent with a formal planning process. New future street connections shown are intended to illustrate vehicular and pedestrian connections which are desired by the Town to increase connectivity, provide more retail storefront and provide multiple travel options which will reduce traffic congestion on collector roads. 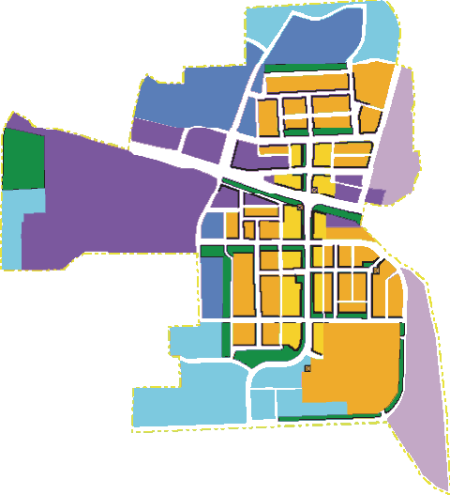 New streets shown are not required to be included in future development plans; however, they are recommended where they can be accommodated. 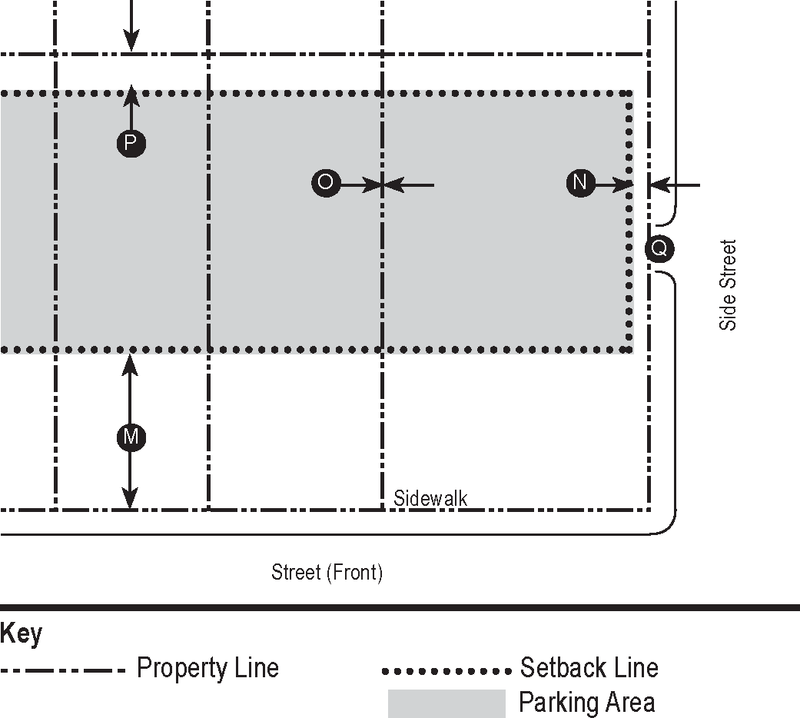 The placement of new streets does not have to conform with their exact locations shown on the map; however, they should provide the general linkage shown from one area or road to another, with alternative alignments or connections as may be approved by the Planning Board. New future streets, where indicated on private land, may be held in private ownership or transferred to public ownership as agreed to by the developer and the Town. 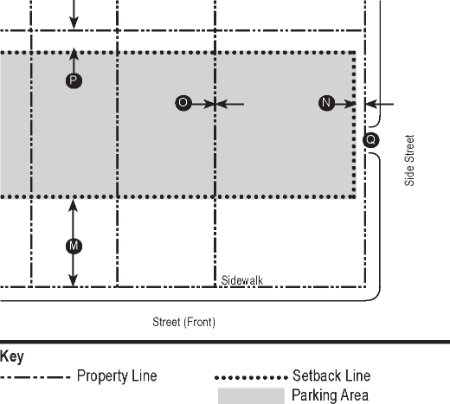 An existing street may not be substantially rebuilt, as determined by the Planning Board, without being brought into conformity with the standards of its associated street type shown on the Future Streets Map. 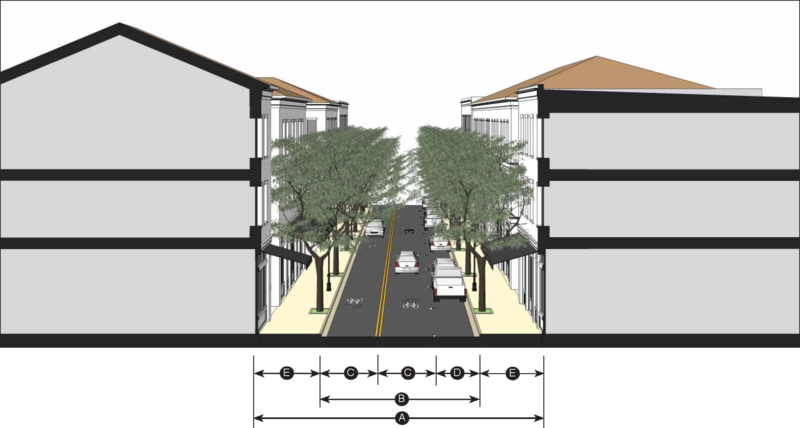 Where an existing street is not planned to be substantially redeveloped, the sidewalk and street trees shall be installed according to the standards of its associated street types. Limits of required streetscape improvements. 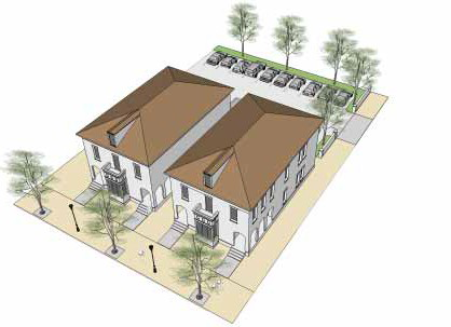 Property owners are required to provide the associated streetscape improvements along the road frontage of all new building development, or building additions in excess of 3,000 square feet in size. 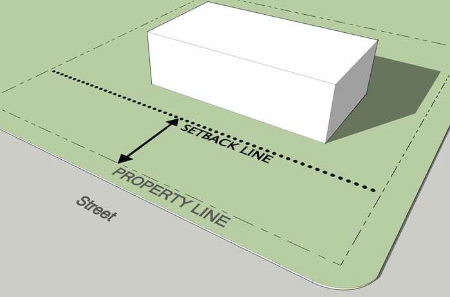 The linear extents of streetscape improvements should be along the entire width of the property frontage so as to provide a continuous pedestrian sidewalk link from one side of the property to another, except as noted below. 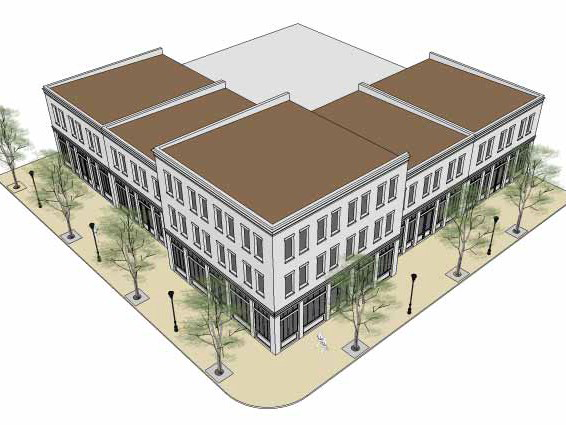 In cases where the width of the property frontage may be substantially larger than the width of the building frontage, the Planning Board may limit the extents of the required streetscape improvements to the immediate area of actual building frontage, as reasonably determined by the Planning Board in consideration of the relative development costs to the size of the overall project. 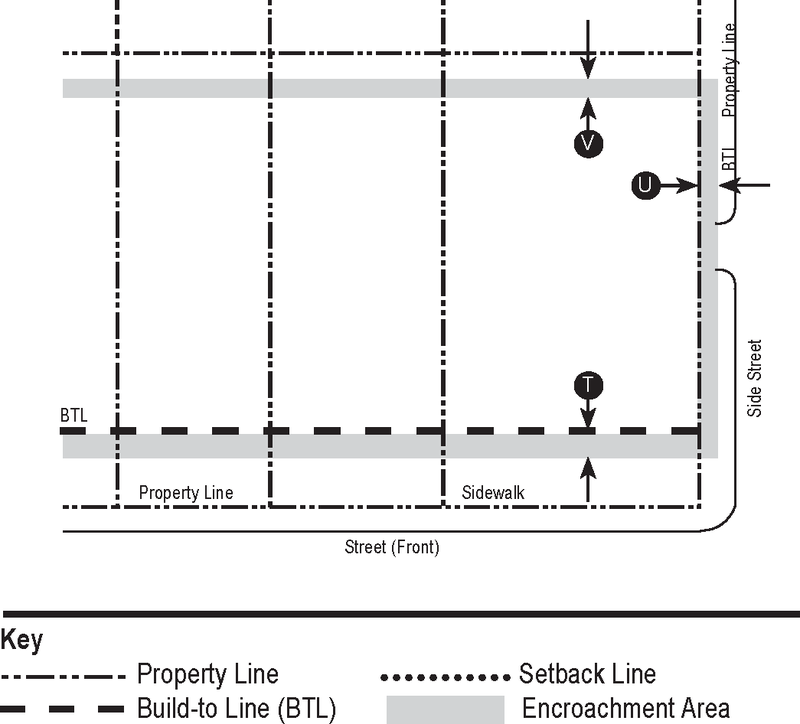 In making this determination, the Planning Board may require the full scope of streetscape improvements to be provided only along the immediate building frontage, while only requiring that a basic sidewalk or multi-use path connection be made to the adjacent property lines to help complete long-term pedestrian connections. As part of the required streetscape improvements, applicants may be required to provide funds into the Town Center Improvement District to fund associated crosswalks and other public roadway elements that would serve the property. 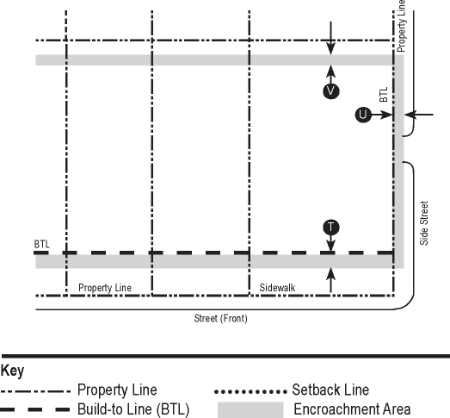 Street types defined in this section include: Boulevard South, Boulevard North, Park Street, Neighborhood Street 1, Neighborhood Street 2, Local Street, and Perimeter Street. Individual descriptions and form requirements of each street type are detailed on the following pages. Specific design considerations. Notwithstanding the illustrated layout of the street types in this section, the final approved design for all new or reconstructed streets shall consider location-specific design considerations, including but not limited to crosswalk locations, signalization needs, accommodation of delivery trucks, loading zones, bicycles, pedestrians and the Americans with Disabilities Act (ADA), as directed by the Planning Board. Medium Trees, evenly spaced @ 40' o.c. avg. 350' min. See Regulating Plan. 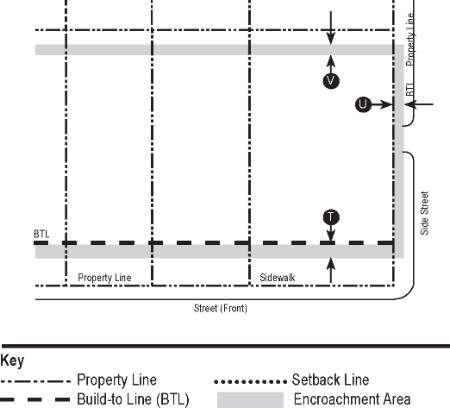 * These areas may alternately be composed of 8' wide on-street parking or 8' wide buffered bike lanes. If used as on-street parking, would require 3' Pedestrian Footway along curb. 200' min. See Regulating Plan. Medium Trees, evenly spaced @ 30' o.c. avg. 100' min. See Regulating Plan. Buildings in new construction shall generally conform with the basic building types set forth in this section and illustrated on the following pages. The building types defined in this section should be used as a general guide to the desired form and function of new buildings within the Clifton Park Town Center. The illustrations and photographs provided are for illustrative purposes only and should not be interpreted literally, especially with regard to architectural styles. Building types set forth in this section include: Commercial Block, Liner Building, Civic Building, Townhouse/Rowhouse, Duplex/Triplex/Fourplex, Live-Work Units, and Ancillary Buildings. Building frontages in new construction shall generally conform with the basic frontage types set forth in this section and illustrated on the following pages. 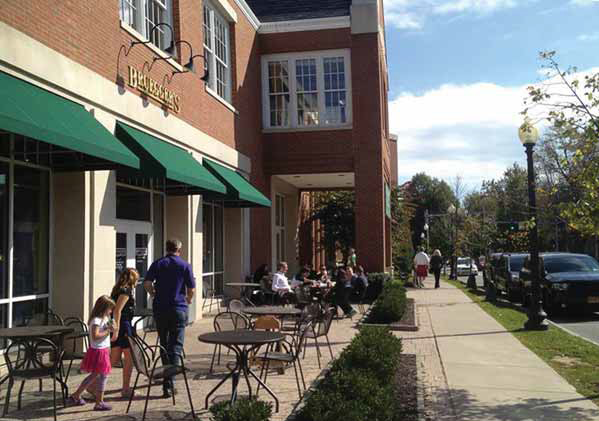 The frontage types defined in this section should be used as a general guide to the desired public spaces within the Clifton Park Town Center. The illustrations and photographs provided are for illustrative purposes only and should not be interpreted literally, especially with regard to architectural styles. Frontage types set forth in this section include: Shopfront, Gallery, Forecourt, Stoop, and Porch. Awnings. Awnings may extend into a required setback. 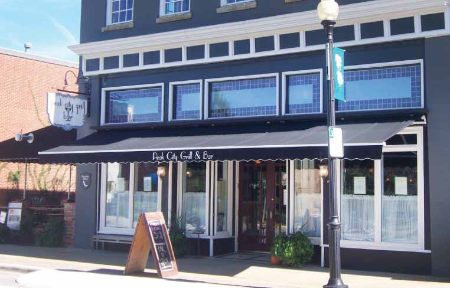 Awnings may extend into a public right-of-way, provided they extend no closer than three feet from the edge of the street or road. 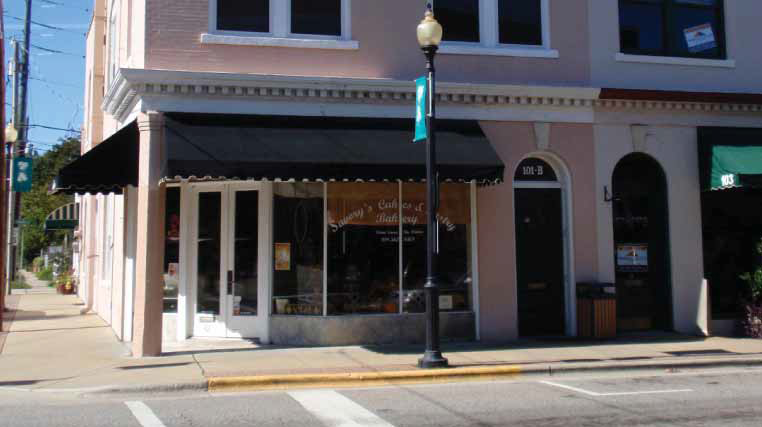 All awnings shall provide a minimum clearance underneath of at least eight feet and shall be a minimum depth of four feet. Balconies. Balconies may extend into a required setback, provided they extend no closer than four feet from a lot line. Balconies may extend into a public right-of-way, provided they extend no closer than three feet from the edge of the street or road. All balconies shall provide a minimum clearance above the sidewalk of at least 10 feet and shall be a minimum depth of four feet. Galleries. Galleries may extend into a required setback. Galleries may extend into a public right-of-way, provided they extend no closer than three feet from the edge of the street or road. Galleries should extend contiguously along at least 50% of the building facade frontage. All galleries shall provide a minimum clearance above the sidewalk of at least 10 feet and shall be a minimum depth of eight feet. Porches. 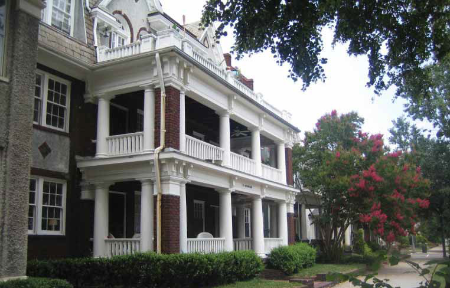 Porches on a front facade shall be a minimum of six feet in depth clear from the face of the facade to the railing and shall extend no less than 50% of the width of the facade. Porches may extend up to nine feet into a required setback. Porches shall not extend any closer than three feet from any lot line or public right-of-way. Stoops. Stoops may extend into a required setback, provided they extend no closer than four feet from a lot line. Stoops may not extend into a public right-of-way. Stoops shall be no more than six feet deep, not including steps. Stoops may include an overhead awning above but shall not be enclosed on the sides. Building eaves, cornices, roof overhangs and light shelves may encroach up to two feet into setback areas, provided they are no closer than five feet from any property line. Bay windows, chimneys and entry vestibules or columns may encroach up to three feet into setback areas, provided the area is no wider than eight feet and no closer than five feet from any property line. Outdoor dining and patio areas may encroach into setback areas, provided they are at grade or within two feet of grade level. Large shopfront windows and seating areas in front of the building help to provide for an active streetscape. A street of commercial buildings of varying heights and widths. Typical large commercial block building with simple massing, regular spacing of doors and windows, and a tall ground floor. The Commercial Block building type is a small to large-sized structure, typically attached, that provides a vertical mix of uses with ground-floor commercial, service, or retail uses and upper-floor commercial, service, or residential uses. 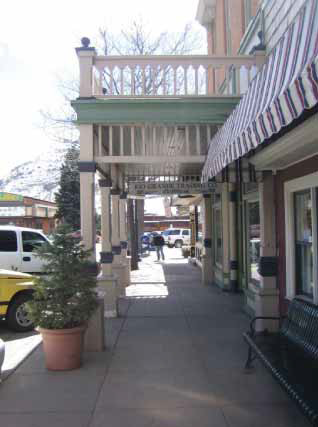 Smaller versions of this type make up the primary component of a neighborhood main street, while larger versions make up the primary component of downtown, therefore being a key component to providing walkability. The liner buildings along the primary street frontage screen a parking garage podium and create a street edge that engages the pedestrian realm. Liner buildings screen views of the large-format retail and parking garage behind. A liner building provides doors and windows along the street frontage. 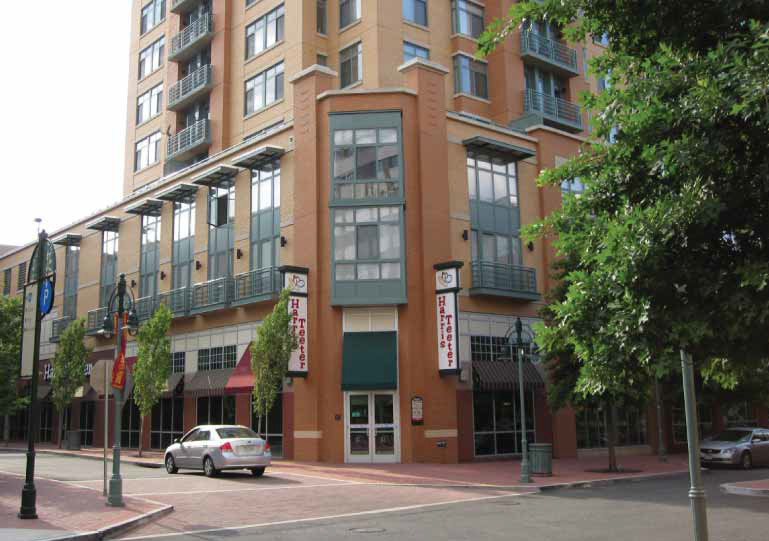 The Liner Building provides a relatively shallow depth of retail and office storefronts around the perimeter of a block while screening a central interior courtyard for use as a public space, parking lot, parking garage or "large-box" retail structure. The purpose of the Liner Building is to provide a smaller-scale pedestrian atmosphere along the sidewalk while screening less visually attractive or utilitarian uses behind it. The drawings and photos on this page are illustrative, not regulatory. The prominent tower of this civic building is a focal landmark. This civic building, while modest in size, has grand proportions. ▪ The scale of Civic Buildings should typically be larger than surrounding buildings in order to be more prominent and visible across greater distances. ▪ Floor-to-floor heights and architectural details should be proportionately larger than those of private buildings that exist or are anticipated to exist within adjacent parcels. ▪ Prominent roof forms and additive elements such as cupolas can visually extend the height of the building. 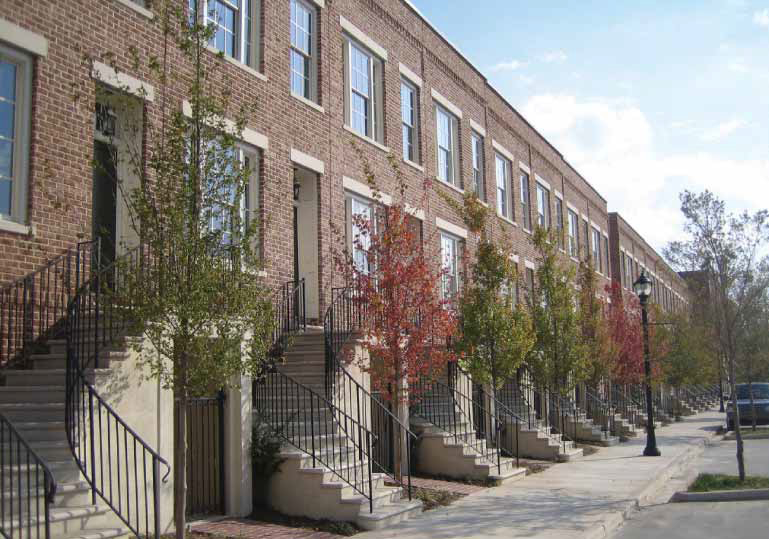 Townhouses are attached to neighboring units, forming a well-defined street edge. 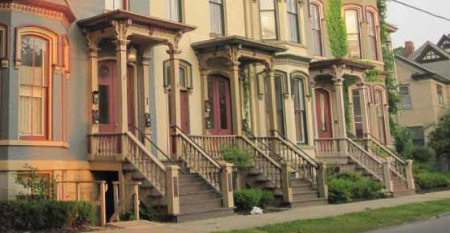 Townhouses are often accessed by using a front stoop. Townhouses define the street edge. The Townhouse, alternately known as the Rowhouse, is a single-family type that is attached to its neighbors on either side. This fourplex building type has individual unit entrances, marked by stoops, that are accessible from the sidewalk. A duplex contains two separate housing units. A duplex with a divided central porch. This is a small multifamily residential type. Units may have individual entrances from the sidewalk or may be accessed through a common building entry. Attached live-work units are a unique building type that can introduce a mix of commercial and residential uses in small increments. Live-work units establish a commercial presence in an otherwise residential area. Live-work units forming a curved facade. The Live-Work Unit is an attached or detached single-family type that includes a commercial component, usually in the form of a ground-floor shopfront space. The Live-Work Unit provides an opportunity to integrate commercial uses in very small increments. 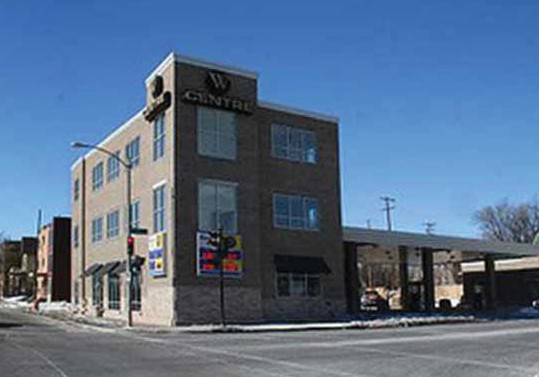 The convenience store of this gas station fronts the street, while the gas pumps and parking lot are screened from view in a midblock location. This bank drive-thru is tucked unobtrusively away from the street corner. This gas stations pumps are located behind the convenience store. 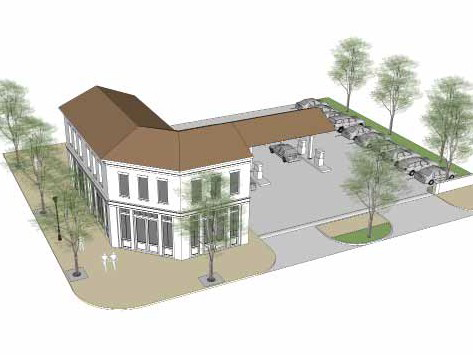 Drive-Thru buildings such as banks or gas stations within the Town Center are to be configured with the building portion of the program located toward the street and the vehicular circulation for the drive thru or gasoline pumps to the rear, screened from view. In this way, Drive Thrus can be accommodated while maintaining well-shaped and activated street frontages. Where possible, curb cuts should be limited to one vehicular entrance/exit so as to minimize interference with pedestrian sidewalks. An example of a shopfront with a recessed doorway. An example of a shopfront with a chamfered corner entry. 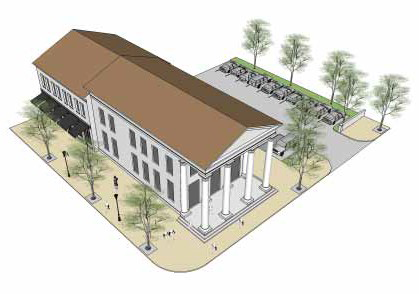 The main facade of the building is at or near the frontage line and shall include a canopy or awning element that overlaps the sidewalk along the majority of the frontage. The canopy is a structural cantilevered shed roof, and the awning is canvas or similar material and is often retractable. 70% of faade width min. Doors may be recessed as long as main facade is at BTL. A gallery with slender metal columns. A masonry gallery with habitable space on the second floor. The main facade of the building is at the build-to line and the Gallery element overlaps the sidewalk, eliminating the need for an awning. This frontage type is intended for buildings with ground-floor commercial or retail uses and may be one or two stories in height. Galleries must also follow all the rules of the Shopfront frontage type. An elevated forecourt forming a dining terrace. The primary portion of the building's main facade is at the build-to line while a small percentage is set back, creating a court space. This space can be used as an apartment entry court, garden space, or for restaurant outdoor dining. Forecourts are especially useful along larger, more auto-dominant thoroughfares in order to provide well-shaped, intimately sized public outdoor spaces. 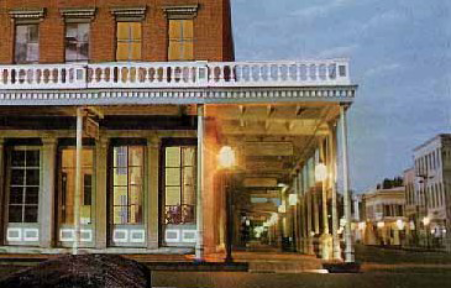 The main facade of the building is at the build-to line, and the elevated stoop projects forward. 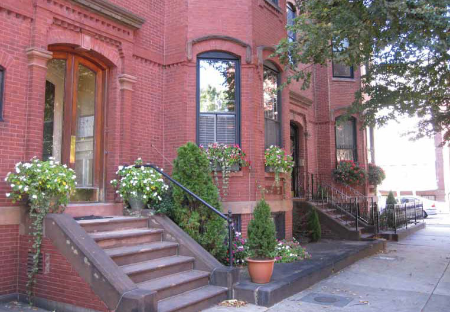 The stoop is used to access a first floor that is elevated above the sidewalk to ensure privacy within the building. Stairs from the stoop may descend forward or to the side. 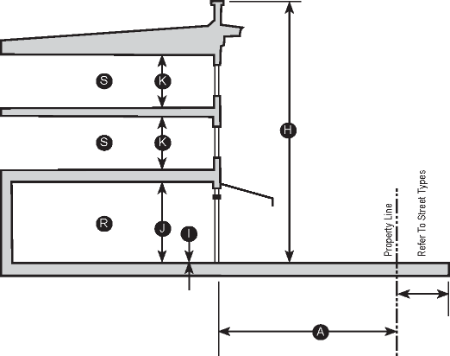 Stairs may be perpendicular or parallel to the building facade. A two-story porch on an apartment building. 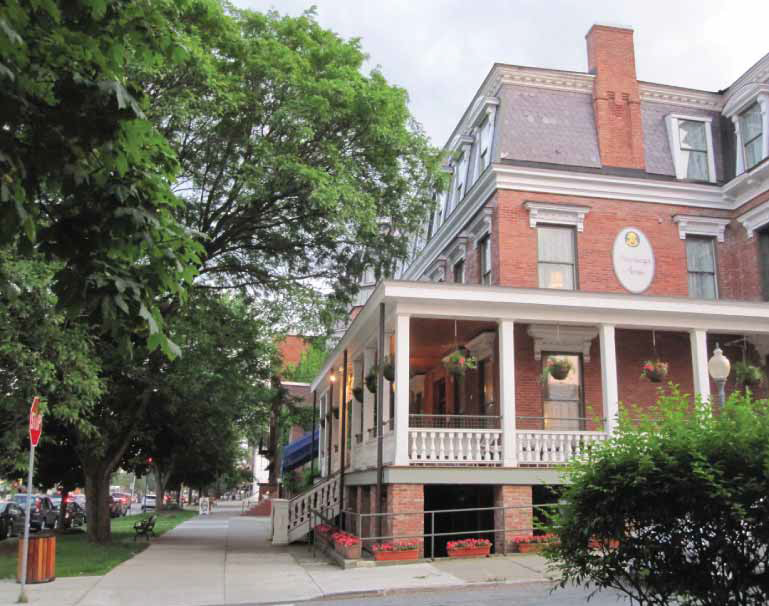 A wraparound porch located close to the sidewalk. Portions of this code which are intended as nonmandatory recommendations (guidelines) are defined using the word "should." Provisions which are considered mandatory requirements (standards) are defined using the word "shall." 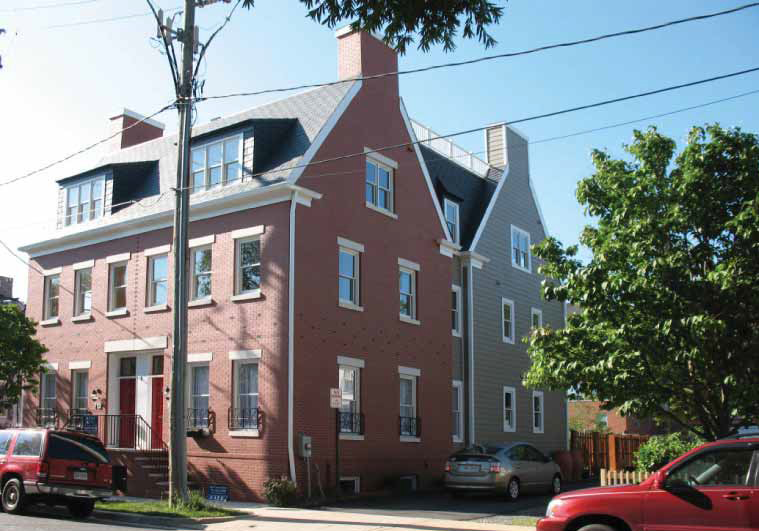 It is the intent of these standards and guidelines to provide substantive design direction while allowing for reasonable flexibility in the cases of renovations or redevelopment of existing properties. Design with the pedestrian in mind. Create attractive and safe routes for people to walk and relax which link to other areas. Limit the visibility of parking areas. Create a local identity. 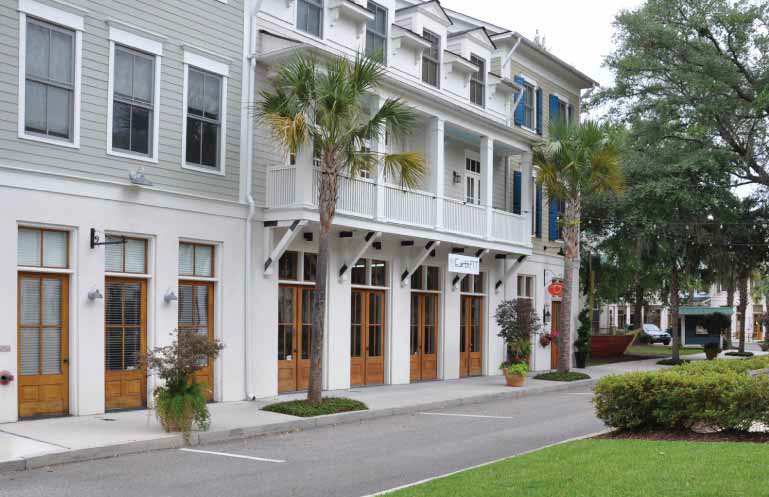 The architecture of the Town Center should be custom designed. Avoid or minimize corporate chain architectural styles. Keep the "park" in Clifton Park. Emphasize green lawns, shade trees and robust landscaping. Ground-floor areas. The ground-floor areas of a facade, especially in pedestrian areas, should exhibit the highest levels of articulation, with larger openings and changes in depth, especially around entry points. Required shopfront facades. Ground-floor shopfront store windows, where required by the Regulating Plan, shall provide a minimum of 50% facade transparency [i.e., square footage of glazed window and door openings (including trim) over square footage of entire facade area on that floor] at the ground-floor facade area, allowing a view at least eight feet into the interior space within. 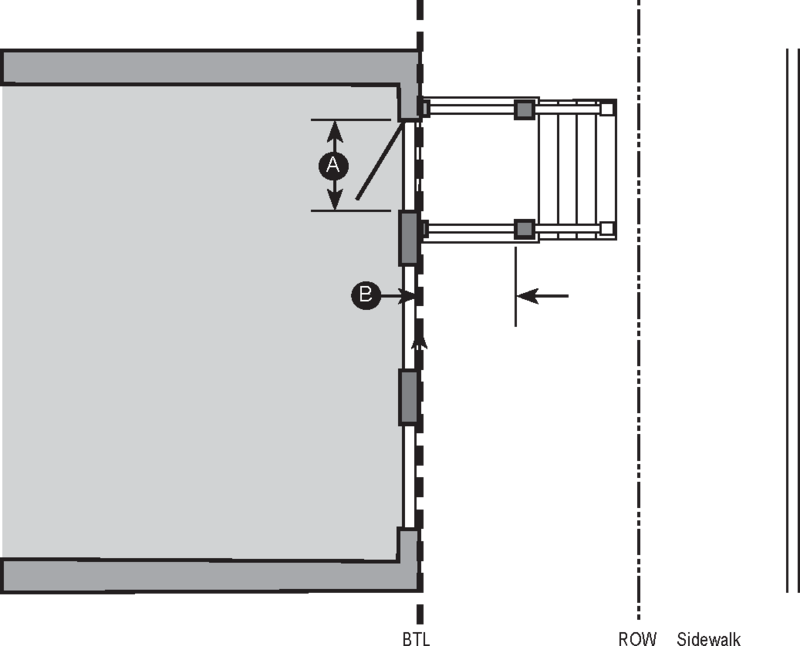 Blank wall areas in required shopfront facade areas shall not exceed the size of a rectangle measuring 10 feet wide by five feet high. Upper-floor areas of the facade above required shopfronts shall be designed to provide a minimum of 20% facade transparency. 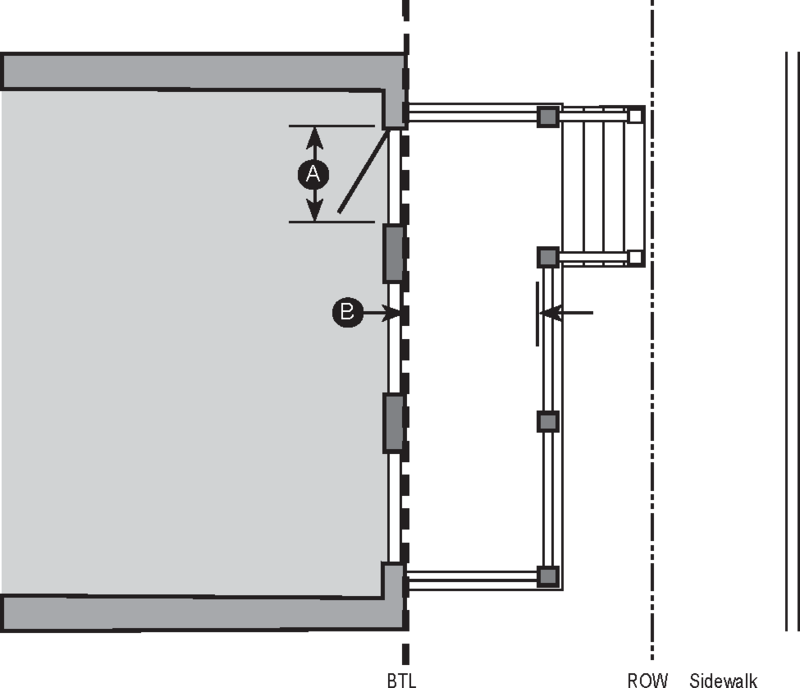 Blank wall areas in floors above required shopfronts shall not exceed the size of a rectangle measuring 15 feet wide by eight feet high. 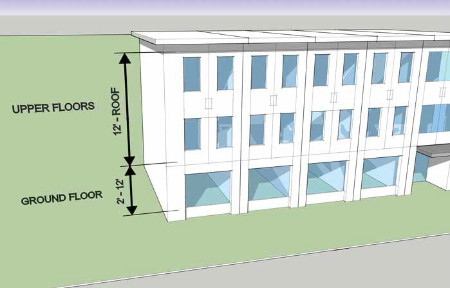 Figure 6.1 - Facade Transparency. Along street frontages where shopfronts are required, the ground-floor area must provide a minimum of 50% transparency. The upper-floor areas of the facades above shopfronts must provide a minimum of 20% transparency. Entry/exit doors. Public entry and exit doors which swing outward shall be recessed into the facade a minimum of three feet where the sidewalk abuts the building. Window and door openings. 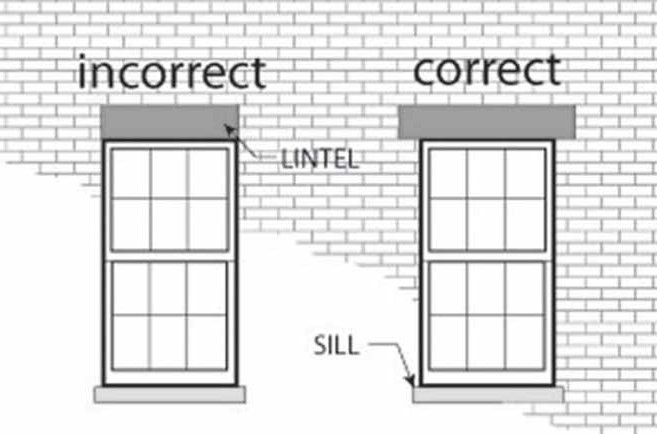 Window and door openings in masonry facades should express a structural lintel above to express how it is carrying the weight. A similar method using wood trim can be used on wood-clad facades. 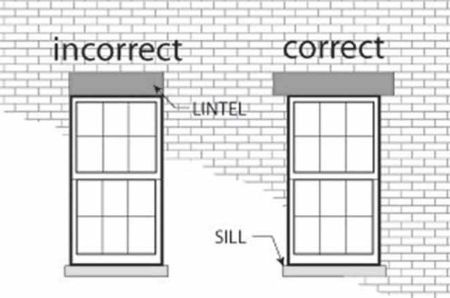 Figure 6.2 - Openings in masonry facades should visually show a structural lintel above the opening to express how it is holding the weight above it. Columns/posts. The proportion of structural elements such as columns or posts should be appropriate to the weight they appear to be carrying. Flat roofs. 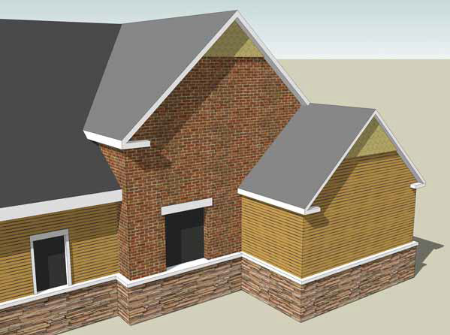 Flat-roof structures shall be capped by an articulated parapet design which provides a noticeable "cap" to the building. 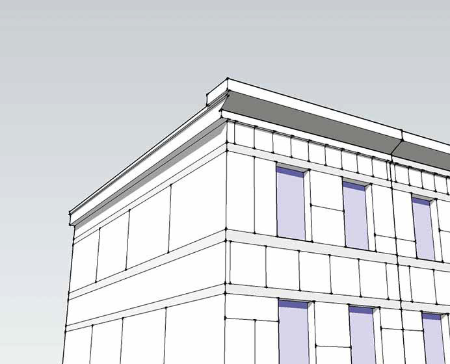 The parapet on a single-story facade should express at least six inches in overhang depth and be at least 18 inches tall. 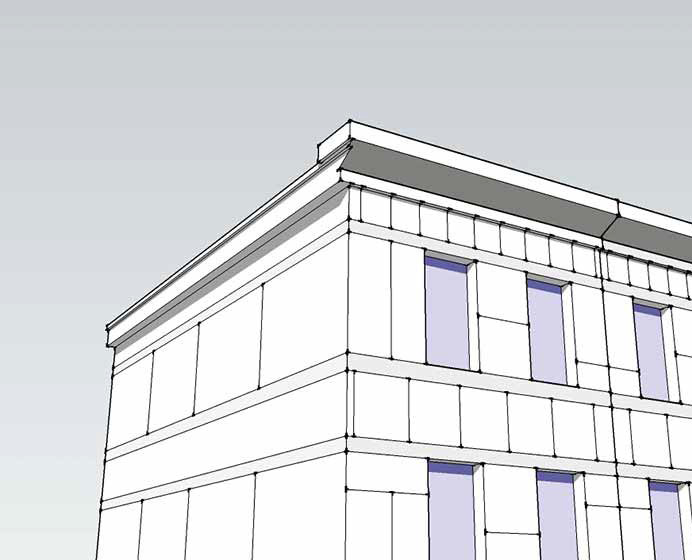 Parapet overhang depth and height for taller facades should be increasingly larger. Figure 6.3 - Flat roof parapet design. Sloped roofs. Sloped roof structures are encouraged to maintain a pitch between 6:12 minimum and 12:12 maximum for all primary roof areas (not including dormers, entry canopies or similar accessory elements). Roof overhangs are encouraged to be at least six inches deep. Dormers and gables are encouraged along front facades to help maintain a prominent facade, reduce the scale of long runs of roof and divert rainwater and snow from entry areas. Shapes help break up the scale. The overall massing of buildings should have areas of noticeable 3-D relief or be broken down into smaller shapes to reduce the scale and avoid the appearance of a "large box." Avoid trying to break up the scale and massing of a large facade by making it look like many different building facades stuck together. This often results in a fake "Disneyland" appearance. 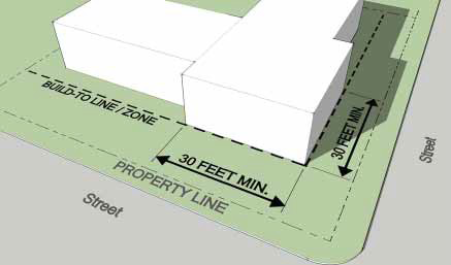 "Courtyard breaks" (courtyard areas) should be provided no less than every 300 feet of facade length. These should create a change in facade depth at least 20 feet deep by 40 feet wide and a change in facade height of at least eight feet. The courtyard space provided shall be designed to be accessible to pedestrians with attractive amenities such as seating, landscaping, storefront displays and/or entranceways. "Major articulations" should be provided no less than every 150 feet of facade length. These should create a change in facade depth at least four feet deep by eight feet wide and a change in facade height of at least four feet. 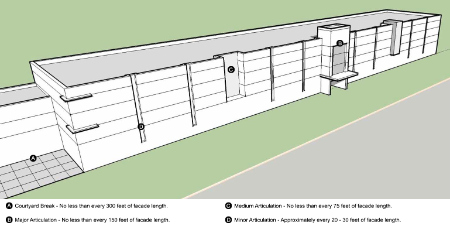 "Medium articulations" should be provided no less than every 75 feet of facade length. These should create a change in facade depth at least two feet deep by four feet wide. 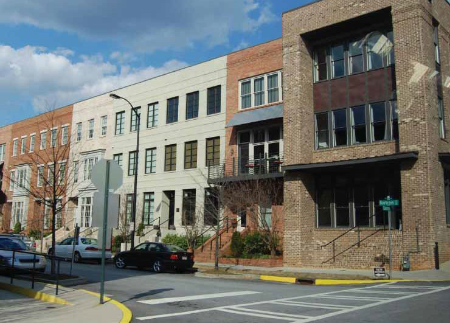 "Minor articulations" should be provided approximately every 20 to 30 feet along a facade. These should create a change in facade depth at least eight inches deep by 12 inches wide. Note that the recommended articulation placements listed above are not additive you would not need a major, medium and minor articulation all at the same location. The largest articulation required would override all lesser ones. 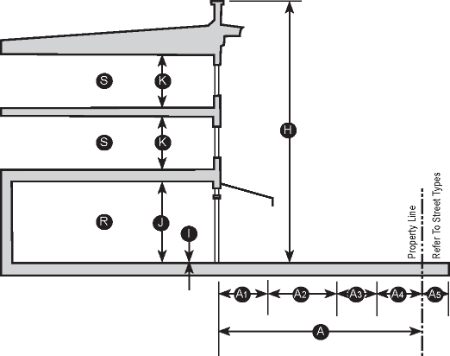 Figure 6.5 - Large Building Massing. The public frontage of long buildings should be designed with a variety of minor, medium and major articulations and courtyard breaks to avoid the appearance of one long, uninterrupted facade. Primary facade materials. As listed in Table 6.1, are recommended for not less than 70% of the exterior wall surface on all facades facing a public street. Smaller-scale, natural materials should be used whenever possible, especially on front facades and near pedestrian areas. 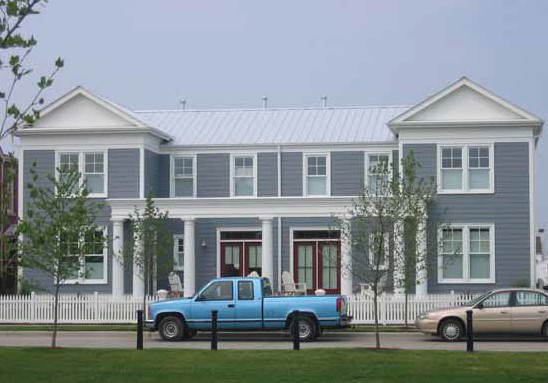 Exterior colors should typically be a natural, muted shade. Brighter, more-vibrant colors such as red or yellow should be reserved for minor accents and highlights only. Secondary facade materials. As listed in Table 6.1, should be used as accent materials on not more than 30% of the exterior wall surface on all facades facing a public street. Other materials. Other materials listed in Table 6.1 as "Not Recommended" should avoid being used or should be used only in service areas which are not intended to be accessed by pedestrians or readily visible from a public way. Material changes. Changes from one material or color to another along the horizontal direction should occur at "inside corner" transitions. Changes in materials or color along the vertical direction should occur at a hard-edge "bump-out" transition which gives the material a surface to terminate into. 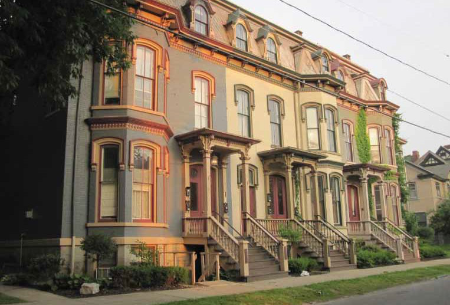 Facades with an overabundance of different materials or colors are generally discouraged. Figure 6.4 - Correct material transitions. Changes from one material to the next should occur at logical terminations, such as inside corners. (1) When using more than one primary facade material, one should be used as the dominant theme, with the others used more sparingly to accentuate the design. Note: All material and paint colors should be of a natural, muted shade, except as used for specific design accents or highlights. Alternate materials to those listed above may be approved by the Town, provided they are considered to be equivalent or better quality and appearance. V.L.T. is "visible light transmission." Mechanical equipment. Mechanical equipment, including roof-mounted, facade-mounted or ground-level-mounted, shall be screened from view from adjacent public rights-of-way, properties and pedestrian walkways (does not include service alleys). Screening shall be achieved with nondeciduous landscape plantings, architectural building elements which match the exterior building materials, or parapet walls. Applicability. The parking requirements of this section apply to all commercial and residential properties applying for a permit for construction, renovation, addition, site plan alteration or change of use. This section does not apply to on-street parking provided in the public right-of-way. Changes in use and additions. The minimum parking requirements for a property shall be reviewed for compliance with this code which result in increased customer space or which create a more-intensive parking use. Minimum parking requirements. The minimum on-site parking requirements for each use shall be as listed in Table 7.1, unless parking reductions through the use of staggered-hours or shared parking arrangements are approved as detailed below. Fractional results shall be rounded up. Values shown are for net usable square feet (not including mechanical, storage, etc. ), unless otherwise noted. 1 per fuel pump + emp. 2 per service bay + emp. 1 per each table/lane + emp. 1 per room + emp. Notes: "+ emp." indicates to also include one parking space for each employee on duly during a typical shift. 1Restaurants with outdoor seating shall only calculate 50% of the outdoor seating area toward the parking requirements. Reduction in the minimum amount of required parking through an approved staggered-hours or shared parking arrangement, as described below. Reduction in the size of the proposed expansion. Reduction in the intensity of the proposed use change, including but not limited to a denial of the change of use. Preexisting asphalt paved areas no longer needed by a new proposed use shall be removed and reclaimed as landscaped areas, islands, rain gardens or other pervious treatment. That excess parking be held in future reserve. That excess parking be configured as public parking which is specifically located and designated with signage as available for public use, with sidewalk connections to adjacent areas. That excess parking areas and associated travel lanes be constructed of pervious paving surfaces in lieu of traditional asphalt. 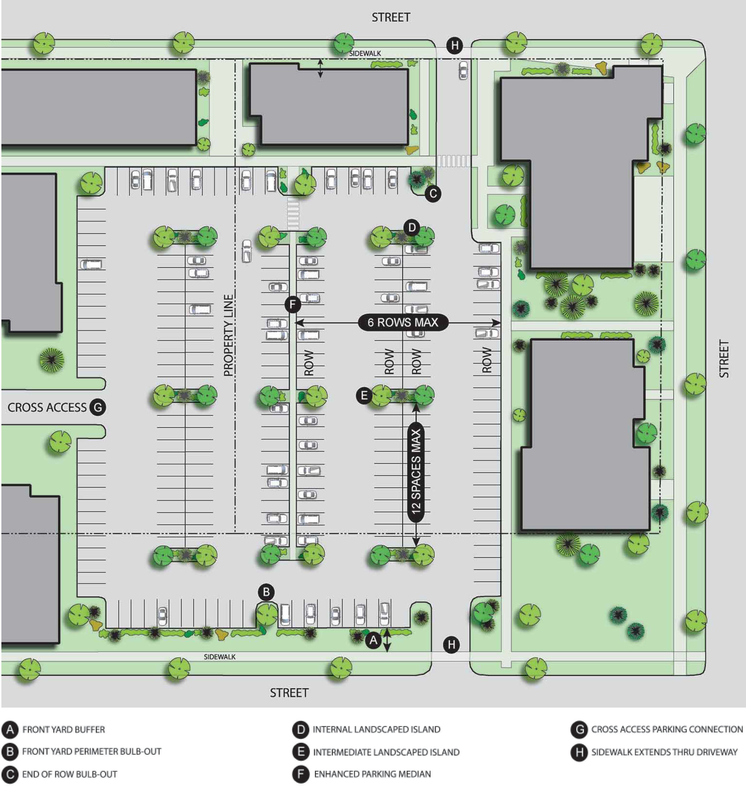 All properties are required to provide cross-access connections to adjacent parking lots and are encouraged to provide unreserved or shared parking arrangements with neighboring properties. 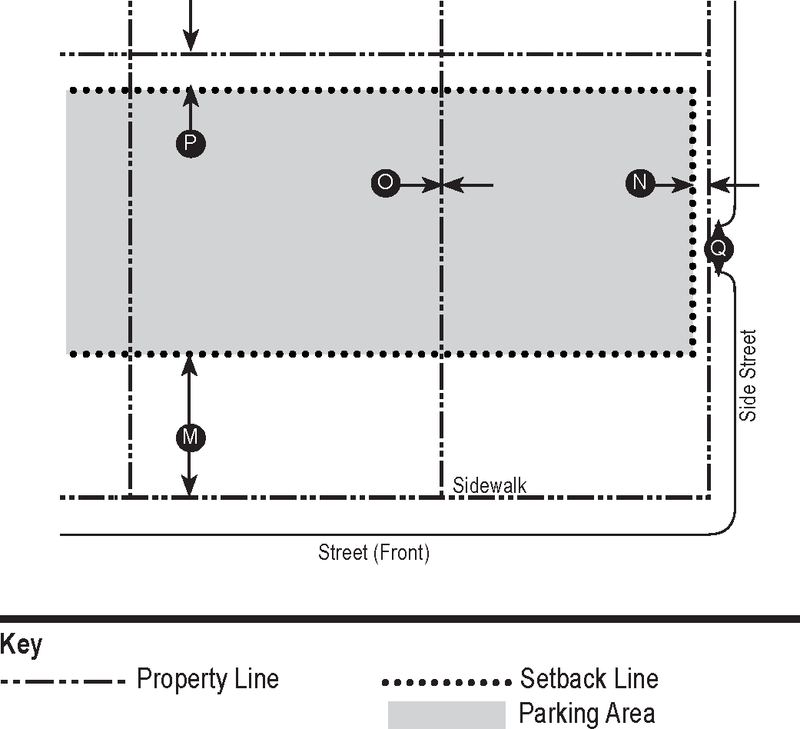 All off-street parking areas should be consolidated within the center of street blocks where possible, behind buildings. A clear, designated pedestrian way(s) shall be provided from parking areas to the building entrances. Building entrances from parking areas, including rear (opposite front/side facades) entries, shall provide attractive, welcoming, architectural entry treatment. 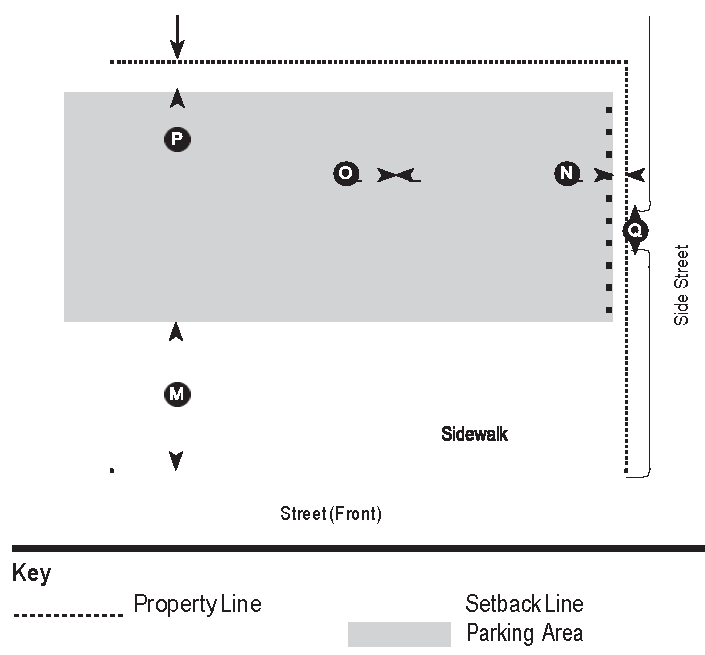 One required off-street parking space may be substituted by each on-street parking space existing directly in front of the business within the public right-of-way or public street. 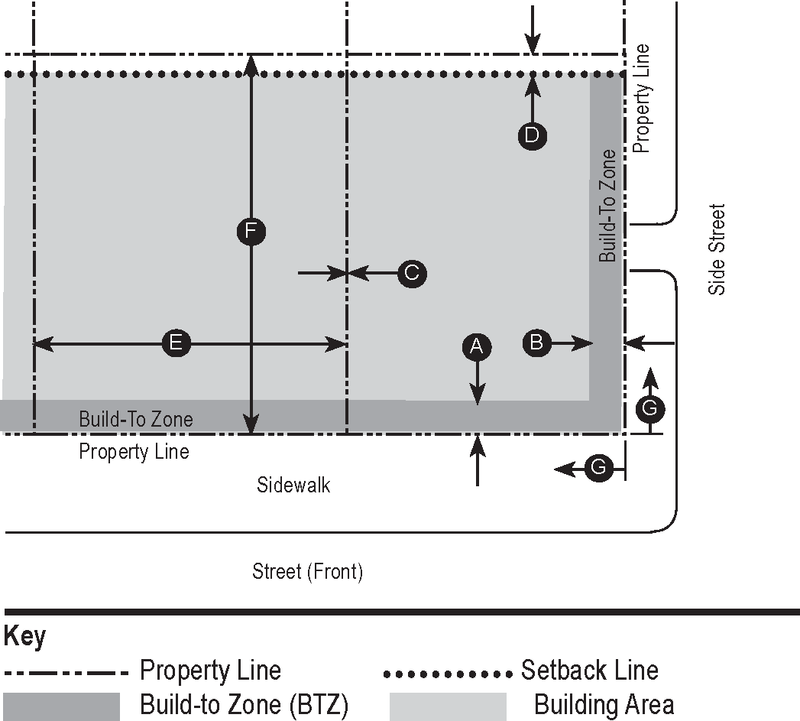 Each on-street space may only count toward one property. Required off-street parking, including employee parking, may be provided on a different lot than the subject property, provided it is counted as part of an approved shared parking agreement. Seasonal outdoor dining or bar areas shall be calculated at the reduced rate of 50% of the normal parking requirements. Staggered-hours parking. A reduction in the minimum number of required parking spaces may be approved for combinations of uses which have a staggered demand schedules over time, such as daytime office with residential. 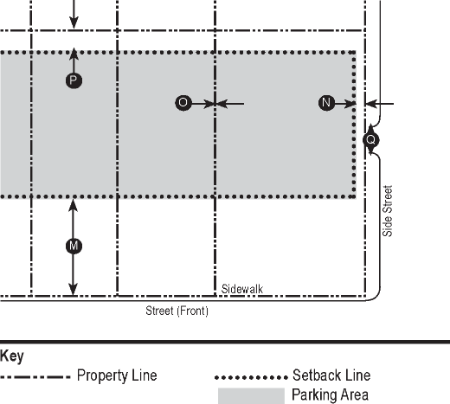 Staggered-hours parking may be utilized by single properties with multiple uses, and by multiple adjacent property owners who physically merge or connect their parking lots into a common shared lot, as approved by the Town Engineer. An example guide for calculating staggered demands between multiple uses is provided in the appendix for reference. Editor's Note: See § 208-29, Appendix. Shared parking agreements. A reduction in the minimum number of required parking spaces may be approved for two or more adjacent property owners or businesses who share or physically connect their lots and agree to a shared parking arrangement. The total number of parking spaces which may be deducted from the shared lot shall be as shown in Table 7.2, Allowable Shared Parking Reduction. The majority of the parking provided in the shared lot must remain unreserved. 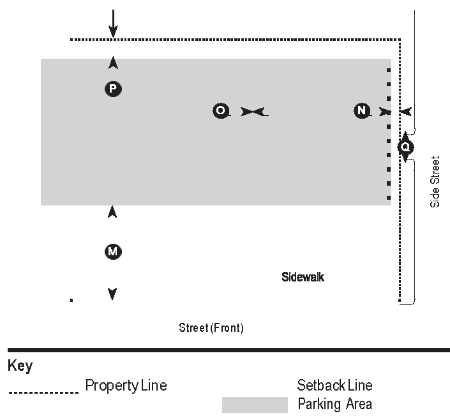 Shared parking reductions may be combined with staggered-hours parking reductions. Notes: Numbers shown are the total spaces which may be deducted below the minimum parking requirements for all combined businesses using the shared lot. 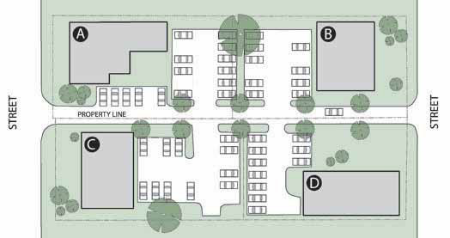 Shared parking configurations of 70 or more spaces may be prorated with one additional space for each 10 additional spaces shared but may not be additionally prorated by the number of businesses beyond seven. 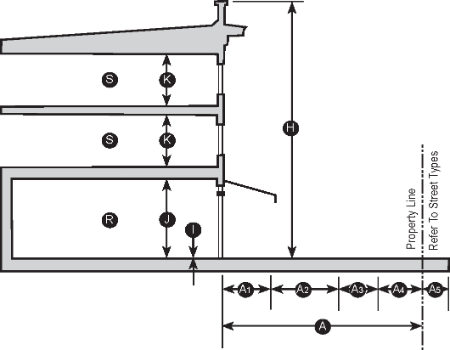 Figure 7.1 - 90-Degree parking. 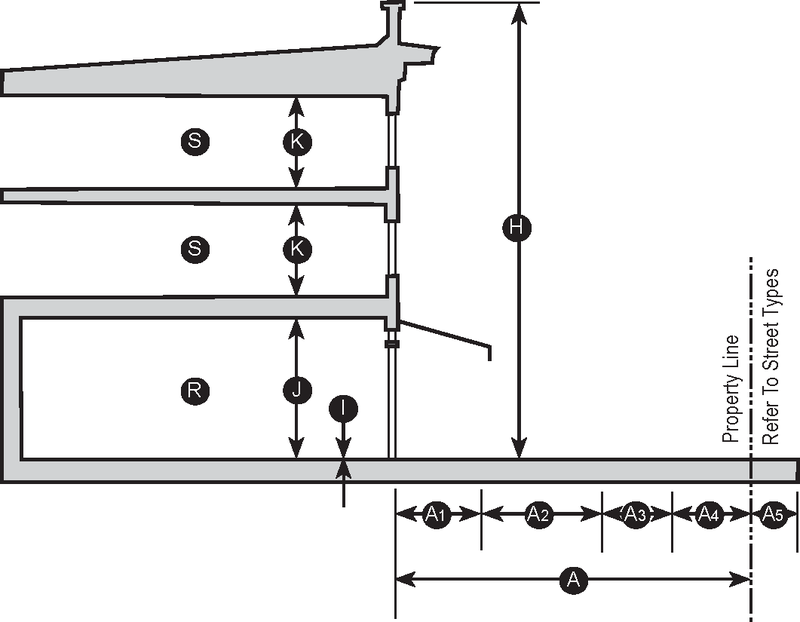 Figure 7.2 - 60-Degree parking. Figure 7.3 - Parallel parking. Provision for transit facilities, including bus/bus rapid transit stops/pull-offs shall be coordinated with regional and local transit agencies, and such facilities shall be incorporated into site plans as directed by the Planning Board. Landscaped medians shall separate the rows of parking on either side with a continuous six-foot-wide landscaped band which includes additional landscaping and trees no less than every 30 feet. 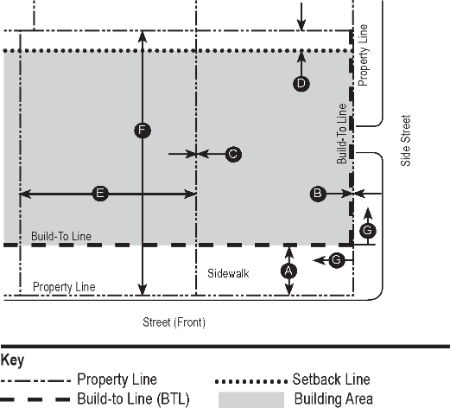 Pedestrian medians shall separate the rows of parking on either side with a continuous six-foot-wide pedestrian sidewalk - flush to grade - which leads toward building entry areas and connects to perimeter sidewalks with crosswalks. Figure 7.4 - General Parking Concepts. 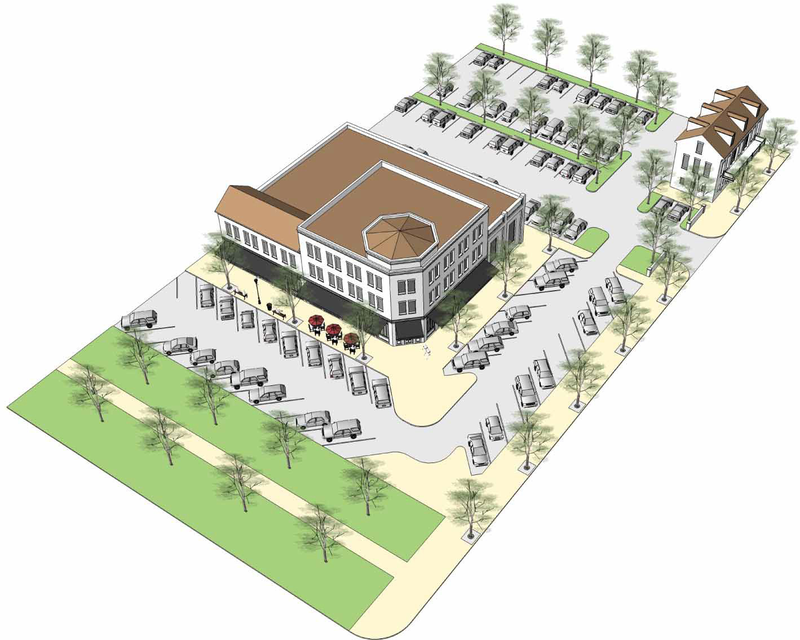 Parking lots should strive to create shared parking areas within the center of blocks which can be utilized by all surrounding properties to maximize efficiency and put the visual focus on the buildings. This concept can be further adapted to provide a multistory parking structure within the center of the block, greatly increasing parking capacity and freeing up more land area for development. Figure 7.5 - Enhanced Parking Medians. Enhanced parking medians, where required to break up larger parking lots, can be provided as one of two types: Landscaped (left) or Pedestrian (right). 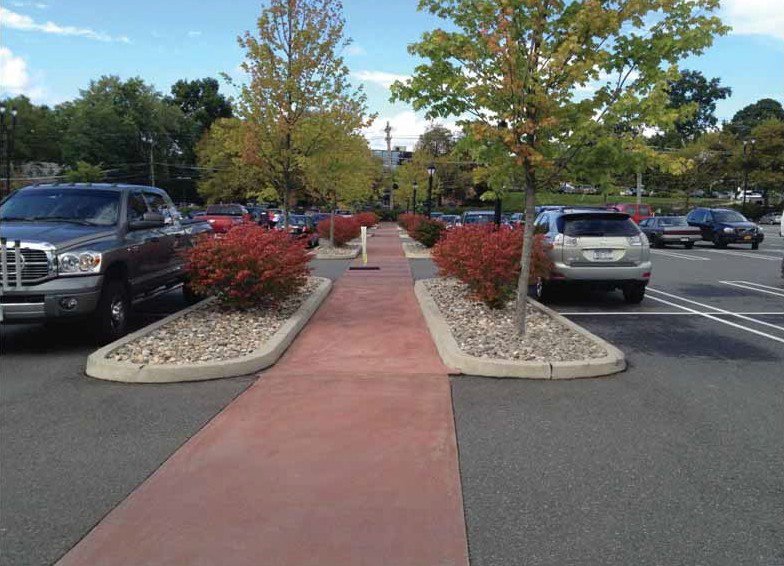 Figure 7.6 - Example of an enhanced parking median design which provides a clear path of travel through the parking lot for pedestrians. 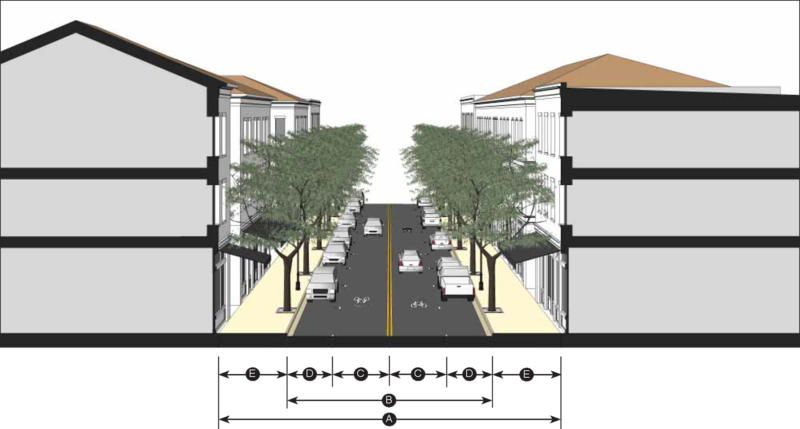 Figure 7.7 - Shared Parking Concept (Existing/Before). Each property (A, B, C and D) has its own separate parking lot and driveway access. During the peak business hours for Property D, a new customer arrives but finds there are no parking spaces. 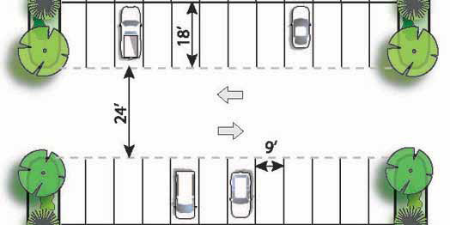 Figure 7.8 - Shared Parking Concept (After). Properties A, B, C and D agree to connect their parking lots and have a shared parking agreement. During peak hours, a new customer comes to Property D and finds there are plenty of available parking spaces because not all businesses are experiencing their peak demand at the same time. This parking redesign also eliminates a curb cut and the parking in the front and side yards, allowing these areas to be reclaimed as attractive front-yard landscaping or patios instead. Service areas and loading docks. Trash and recycling dumpsters or similar collection areas shall be located in the rear or to the side of buildings and screened from view from adjacent public rights-of-way, properties and pedestrian walkways (not including service alleys). Screening shall be achieved with building enclosures on three sides which match or complement the exterior building materials. Applications for building improvements or renovations which do not increase the gross floor area of the property shall not be required to meet the landscaping requirements of this section. Applications for a change of use shall not be required to meet the landscaping requirements, except where additional screening or buffers may be required. Applications for site improvements such as parking lot or driveway reconfigurations shall only be required to meet the landscaping requirements for the areas affected. Applications for building expansions which increase the gross floor area by less than 50% or 5,000 square feet shall only be required to meet the landscaping requirements for the portions of the site affected, as determined by the Planning Director. Applications for building expansions which increase the gross floor area by more than 50% or 5,000 square feet shall be required to meet the landscaping requirements. See Subsection 3 for specific landscaping requirements pertaining to parking lots. Sod, lawn, or other variety of ground cover in combination with any of the above. All landscaping shall be installed in accordance with the landscaping plan as approved by the Planning Board prior to issuance of a certificate of occupancy and shall be installed in accordance with accepted landscape practices within the region. In instances where conditions do not permit immediate planting, the applicant may be required to post a performance bond or, in lieu thereof, sufficient moneys to ensure later compliance. All landscaping shown on an approved site plan or landscaping plan shall be maintained in a vigorous growing condition throughout the duration of the use, and plants not so maintained shall be replaced with new plants at the beginning of the next growing season. Landscaping and buffer requirements in this section may be met by utilizing existing vegetation where possible, with approval from the Planning Board. The use of invasive plant species, as defined by the most-recent DEC Advisory Invasive Plant List, is not permitted. Species diversity is encouraged in order to prevent extensive vegetation loss should certain species become vulnerable to diseases. In cases where there are more than eight required new trees to be planted, no more than 40% of them can be of one species. Where more than 24 new trees are required to be planted, no more than 24% of them can be of one species. Front yard landscaping requirements. Front yard landscaping should be provided and arranged as illustrated in the Building Placement and Front Yard Design requirements for each TC Zone and in the corresponding Street Type. Required landscaped terrace areas shall provide a mix of lawn areas in combination with deciduous trees, shrubs or perennial/annual beds. Required tree lawns shall be provided with sod or lawn, except for mulch areas directly around each tree. Street trees within required tree lawns or planters shall be shade trees (not ornamental) with a minimum caliper of three inches and a minimum height of eight feet. Required tree planters shall be covered with cast-iron tree grates flush with adjacent sidewalk surfaces meeting ADA requirements for minimum opening sizes. Editor's Note: See § 208-22 and § 208-23. Applicability. The lighting requirements of this section apply to all commercial and residential properties applying for a permit for construction, renovation, addition or site plan alteration. This section does not apply to public streetlighting installed by the Town of Clifton Park in the public right-of-way. Preexisting site lighting fixtures which are removed or replaced shall be brought into conformity with this section. Preexisting buildings which undergo a renovation exceeding 50% of the value of the structure, or addition increasing the floor area by more than 50%, shall bring the existing site lighting of their property into conformity with this section. All fixtures shall be full-cutoff, downward-facing. Light fixtures located within the interior asphalt area of a parking lot shall not exceed 30 feet in height. Light fixtures located along the perimeter edge of a parking area within 50 feet of a property line shall not exceed 15 feet. Average 0.2 footcandle at grade level, maximum 2.0 footcandles. Light fixtures located along pedestrian walkways adjacent to parking lots shall not exceed 15 feet in height. Light fixtures located along internal pedestrian walkways or paths not adjacent to a parking area shall not exceed 10 feet in height. Average 0.2 footcandle at grade level maximum 2.0 footcandles. Provided via uplighting to reflect off of the underside surface of the canopy with a shielded fixture that directly lights onto the canopy bottom only. Average 3.0 footcandles at grade level, maximum seven footcandles. All exterior building or security lighting must be full-cutoff, shielded and/or angled downward to focus the light only on the intended doorway or walkway as necessary. Security lighting is encouraged to be provided with regular pedestrian light fixtures where visible from the street or public way to match others used on site. Building-mounted architectural "accent lights" are permitted as downward-facing only. Average 2.0 footcandles, maximum four footcandles. Light quality and color. LED (light-emitting diode) fixtures are recommended for energy savings and longevity, provided the light is within the temperature range between 2,500 and 3,800 Kelvin. Cobra-head-style fixtures with dropped lenses. Building- or ground-mounted architectural accent uplights, or fixtures which provide no "top cap" to prevent light spill upward into the night sky. Laser lights, searchlights or similar high-intensity beam fixtures. All new development or redevelopment projects shall provide common pedestrian amenities, such as benches and bicycle racks, commensurate in quantity to the size of the project, as directed by the Planning Department. All signs within the Town Center shall be governed by Chapter 171 of the Town of Clifton Park Code. An establishment engaged in providing services for common household pets, including bathing, clipping, grooming, feeding and day care; may include retail sales; does not include overnight pet boarding. An establishment for the medical care of dogs, cats and other domestic small-animal pets by practitioners of the sciences of veterinary medicine; may include on-site boarding services; does not include outdoor pens, exercise runs or overnight boarding. Porches, balconies, patios, seating areas, canopies, awnings, etc., which extend outward from the facade of a building and which do not typically count as an extension of the facade itself for the purposes of measuring setbacks. Commercial or nonprofit movie theaters, stage theaters, music performances social halls, meeting rooms, convention or catering halls and similar places; does not include religious facilities or outdoor performance space; separate and distinct from "club, live performance." 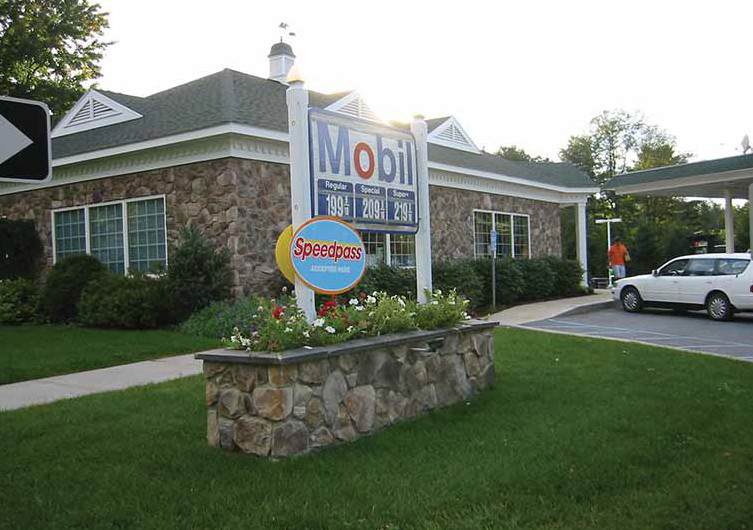 A building or land area intended to be used for the retail sale of automotive fuels; separate and distinct from "automotive, service or wash."
An establishment for the retail sale or leasing of new or used motorized vehicles, including cars, trucks, boats, motorcycles, snowmobiles, campers, RVs, tractors, lawn tractors, construction equipment and similar vehicles. General automotive vehicle services, including oil, brake, muffler or tire replacement, engine or body work, inspections, automated and self-service car washing, detailing or similar services; does not include automotive salvage or junkyard operations. A wall-mounted, cantilevered structure providing shade and cover from the elements for pedestrians; similar to "canopy." A projection of an upper-level floor slab which extends out from a facade, designed for people to stand on, with railings and an access door into the interior. A financial institution licensed for receiving, lending, or safeguarding money, including public commercial, retail banks and credit unions. A bank which includes a drive-up teller, ATM machine or freestanding ATM kiosks. A business primarily engaged in the retail sale of alcoholic beverages for consumption on the premises; may include food service as secondary to the amount of floor area and sales generated by the drink sales; separate and distinct from "restaurants." 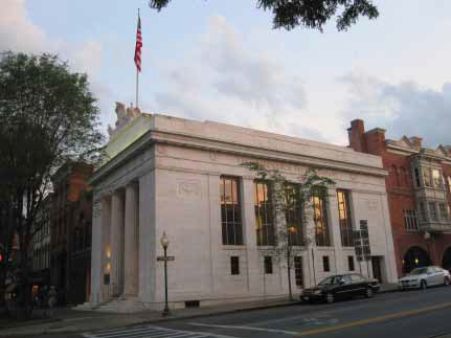 An area on the exterior facade of a building which does not include any windows or door openings; substantial change in materials; or columns, pilasters, archways or other form of articulation or relief greater than eight inches in depth. A wall- and/or post-mounted structure providing shade and cover from the elements for pedestrians; similar to "awning," except that cantilevered portions are supported by posts instead. An organization catering exclusively to members and their guests to promote nonprofit social, educational, athletic, service or recreational objectives, with no vending, merchandising or commercial activities conducted except as required generally for the membership and purposes of the club; includes private veteran, fraternal, social or health clubs; does not include outdoor recreational fields or courts. A nightclub establishment which is designed to provide live music performances to a general audience of more than 50 people and includes the retail sale or consumption of alcoholic beverages on the premises; separate and distinct from "assembly or auditorium." An indoor facility primarily designed to provide recreational sports activities, including but not limited to billiard tables, bowling alleys, painball courses, video arcades, batting cages or similar gaming activities and amusements; does not include outdoor games. 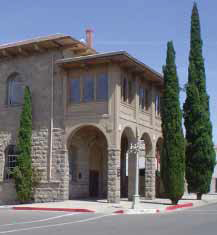 A building and land used for the purposes of public education or entertainment, including museums, libraries, art galleries, community centers, institutional philanthropic uses and similar facilities; does not include theatrical performances, performing arts, dance and music programs, concerts or similar large public gathering events. A family home, which is a personal residence and occupied as a family residence, which provides child day care on a regular basis for compensation or otherwise; includes both "group family day-care homes" and "family day-care homes" as defined in Parts 416 and 417 of Title 18 of the New York Code of Rules and Regulations, respectively. An establishment which provides professional dry-cleaning services for consumers who drop clothing and textiles off to be processed off site and returned; does not include on-site dry-cleaning processing. The exterior vertical wall of a building. The percentage of the facade wall area which includes openings for transparent glass windows and doors. Facade transparency at the first-floor/ ground-floor level is measured between two feet above grade to 12 feet above grade. Facade transparency for upper floors is measured from second-finished-floor level to the ceiling of the topmost floor. Glass is considered transparent when it has a visible light transmission (VLT) rating of 70% or higher. An exterior covered passage which runs along the ground-floor facade of a building and is open at one side. Exterior land areas covered by vegetation meeting the landscape requirements of this code which are free from impervious surfaces such as built structures, driveways, parking lots, paved areas or walkways. Any occupation, business or professional activity which results in a product or service and which is conducted in whole or in part in a residential dwelling or on a residentially zoned property and is clearly subordinate in space utilization and intensity to the residential use. 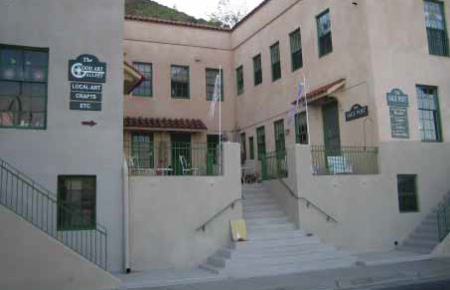 An establishment where overnight lodging is provided in guest units rented to the public on a daily or weekly basis and in which ingress and egress to and from all guest units are made through an enclosed corridor; does not include "boardinghouses." Business premises equipped with individual clothes-washing and clothes-drying machines for the use of retail customers, exclusive of laundry facilities provided as an accessory use in a multiple dwelling; may include pickup and dropoff of dry cleaning which is conducted off site in a separate facility. A piece, parcel or plot of land occupied or to be occupied by a principal building and its accessory building or buildings, including the yards and other open spaces required by this chapter. 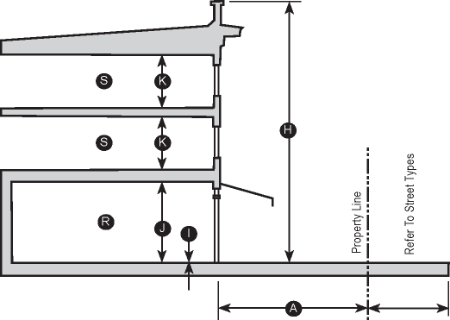 The total horizontal surface area included within the property lines of a parcel. 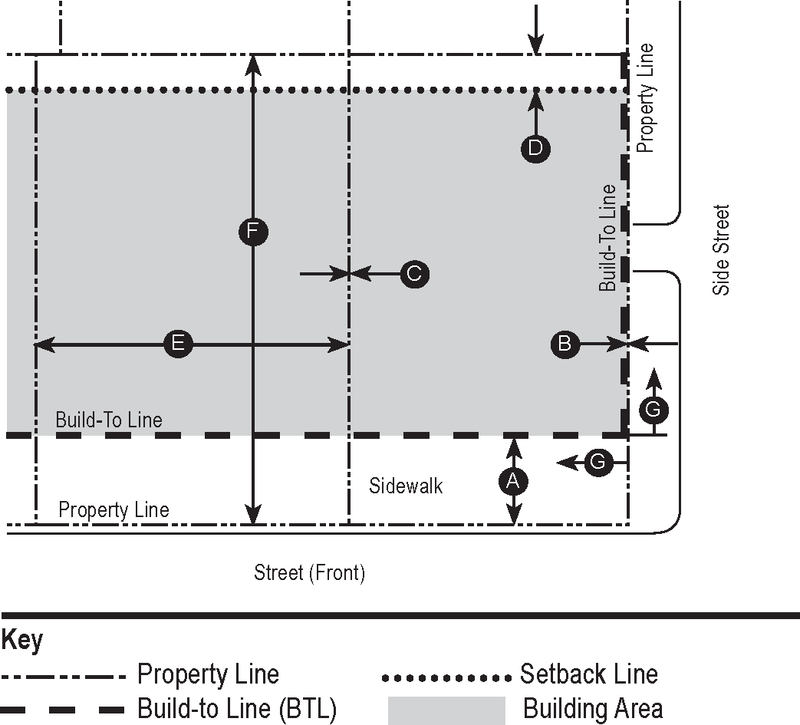 The horizontal distance between the midpoints of the front and rear lot lines measured in the general direction of the side lot lines. The property line along the front of a parcel which directly abuts a public or private street, accessed by that street. 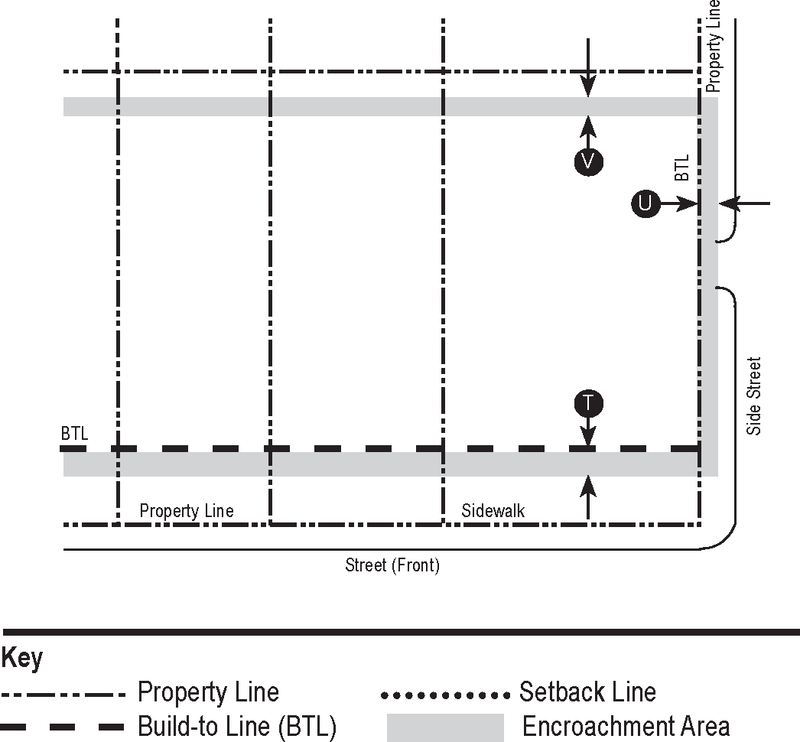 The distance between the side lot lines measured across the required front yard minimum setback line parallel with the street. A facility or clinic for the treatment and medical care of minor human ailments without any overnight inpatient bed facilities; includes eye doctors, dentists, medical clinics, emergent care facilities, lasik eye surgery, physical therapy and similar treatments. 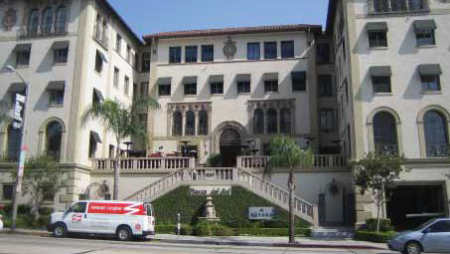 A building or lands used for common civic institutions, such as state, county and municipal government offices, post offices, police stations, fire stations and emergency ambulance service providers under contract to serve the municipality. A licensed facility, other than a hospital, where elderly or infirm persons who are unable to care for themselves are provided with twenty-four-hour care consisting of lodging, meals, personal grooming and cleaning, supervision for medication and other therapeutic needs, recreation and companionship by trained and licensed staff. Offices for the practice of licensed professionals and general business, such as lawyer, accountant, banking, travel agencies, insurance or real estate sales, engineer, architect, doctor, marketing, consulting, not-for-profit organizations and similar professions. A parking facility or deck that includes one or more levels above grade; separate and distinct from parking structures at or below grade or surface parking. 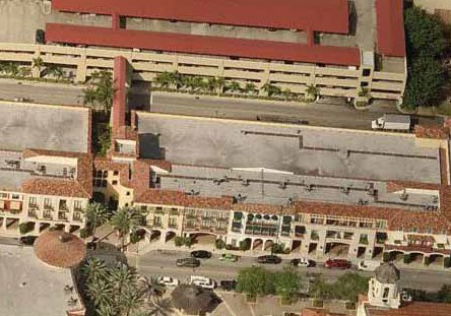 A parking facility located entirely below grade, or at grade within the footprint area of a building overhead; separate and distinct from an above-ground parking structure or surface parking. Personal services for the improvement of mind and body, including nail or hair salons, musical and dance instruction, yoga, karate, licensed massage therapy, physical therapy, fitness center and similar activities. 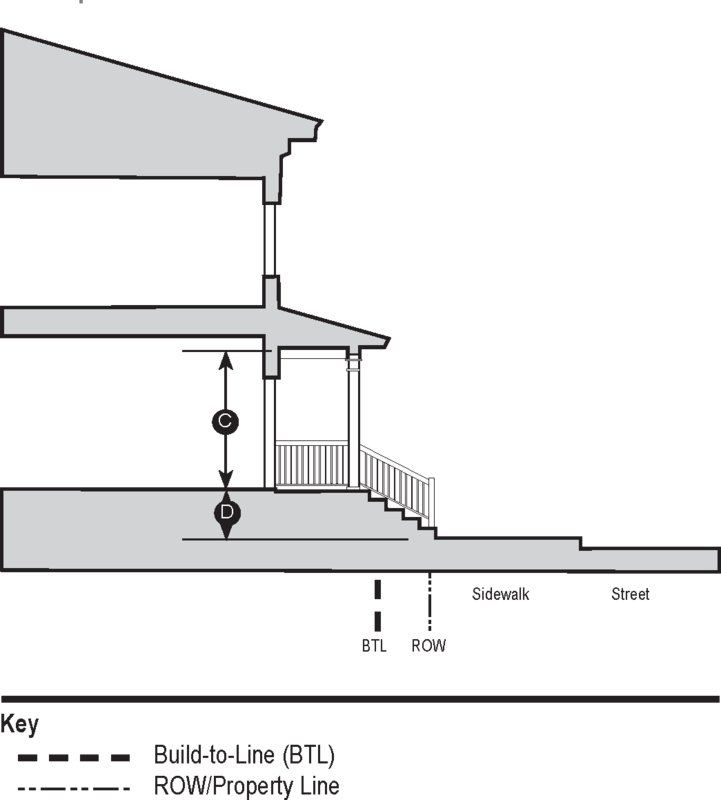 An covered but unenclosed exterior entryway to a structure which is raised above ground level and accessed by stairs or a ramp. The exterior building facade material which comprises or covers the majority of the facade. See also: "secondary facade material." A street, public or private, which has frontage along the front yard of a corner property. See also: "secondary street." A natural or landscaped outdoor area provided for the purpose of active or passive public recreation or enjoyment; may include publicly accessible outdoor amenities, such as a playground, seating area, picnic area, multi-use path and temporary or permanent small outdoor performance space or similar outdoor recreational functions. Churches, synagogues and similar places of worship, Sunday school buildings, parish houses and rectories. On-site repair or maintenance of personal property, such as household electronics, computers, appliances, watches, jewelry or shoe repair, tailoring, upholsterers and similar light work stored and conducted within an enclosed building; does not include repair of heavy machinery. A structure containing both allowable commercial uses on the ground-floor level as well as residential dwelling units on upper floors for two or more families. A structure containing residential dwelling units for two or more families, including apartments, condominiums, townhouses, rowhouses or other combinations. A business primarily engaged in the retail sale of food sold for on-premises consumption to patrons seated at tables or counters and where table service is provided; separate and distinct from "drive-thru restaurant" or "bar and tavern." A food service establishment which includes a drive-thru window. Any restaurant, bar or tavern where some, or all, of the customer seating is provided outside of the building on a porch, patio, deck or balcony. Retail sales of goods to private consumers, including food and groceries, clothing, dry goods and miscellaneous retail services such as reproduction, printing and faxing services; Separate and distinct from "retail with drive-thru." Retail sales of goods or services to private consumers with a vehicle drive-thru area, including pharmacies, banks, dry-cleaning, photo processing, coffee or similar businesses. Retail sales of items stored or displayed outdoors, including but not limited to trees, plants, flowers, landscaping structures, fences, gazebos, cemetery headstones, playground equipment, lumber or similar items; does not include motorized equipment or vehicles. A facility licensed by New York State and designed to provide daytime care or instruction for five or more children from two to 18 years of age, inclusive, and operated on a regular basis. A secondary school designed to teach or train students for a specific trade or job. Exterior building facade materials which are used as a relatively small percentage of the overall materials such as decorative trim, accents and design features. See also: "primary facade material." 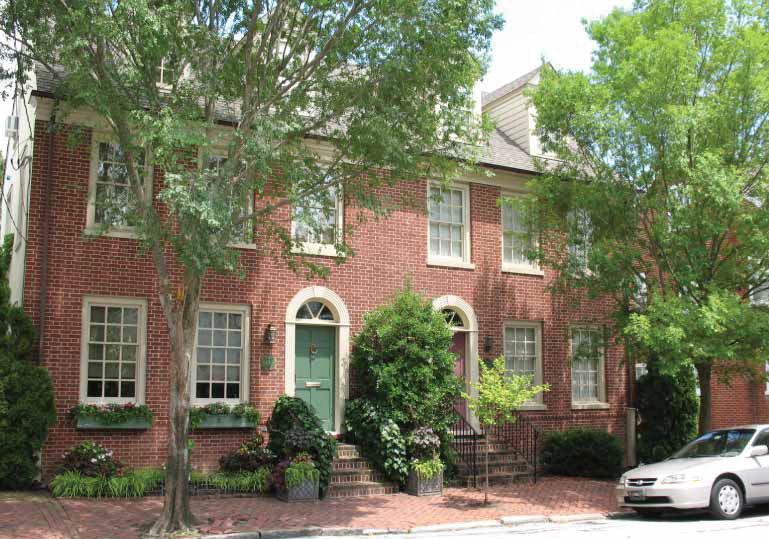 A street, public or private, which has frontage along the side yard of a corner property. See also: "primary street." A building or a group of buildings primarily and specifically designed for providing residential dwellings for persons age 55 or older. The ground-floor portion of a commercial building which is constructed primarily from glass so as to showcase merchandise or services being offered within. A small exterior staircase which leads from a public sidewalk up to a landing outside the entrance of a private dwelling, office or other space, typically not higher than five or eight feet above the ground. A public transportation or intermodal facility designed to accommodate large numbers of people transferring from one mode of transport to another, with parking facilities for private vehicles. 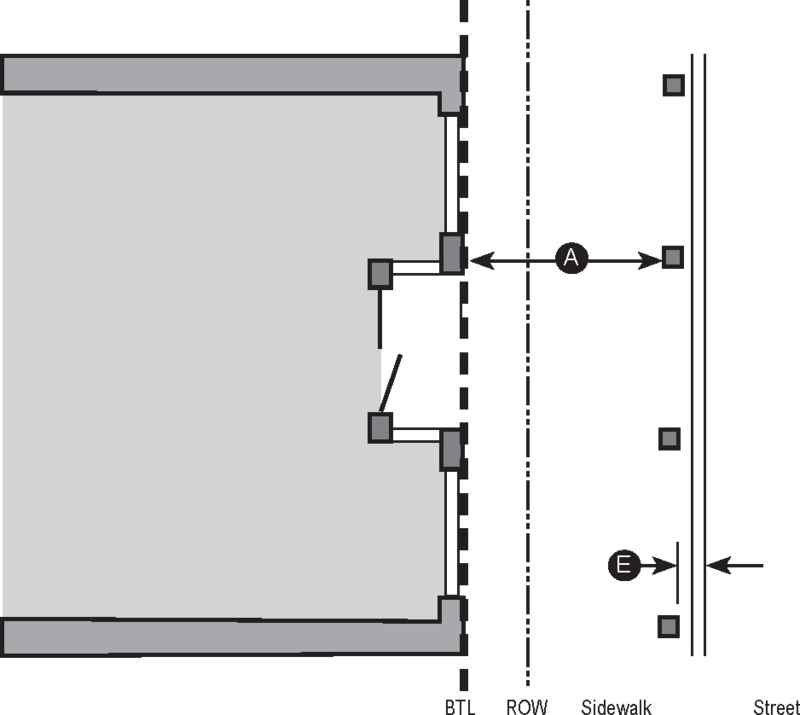 A public transportation waypoint designed to accommodate small numbers of people transferring from one mode of transport to another, used as a satellite branch of a larger transit hub; may include an enclosed building or outdoor shelter with a limited drop-off area for private vehicles and buses; does not include parking. Structures or uses required as part of providing basic local public services, including but not limited to electrical substations, telephone exchanges, water pumping stations, power and communication lines and their necessary right-of-way; does not include telecommunication towers. Stand-alone structures in excess of 20 feet tall for the broadcast of radio, television, cellular or similar communication systems; does not include transmission elements with an approved design to be mounted onto the facade of a building, such as local wifi or cellular service. 6 p.m. - 12 a.m. 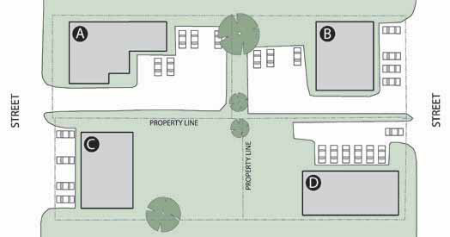 EXAMPLE: Two adjacent property owners (or a single property owner with multiple uses) wish to share a parking lot which takes advantage of staggered hours parking demands. One use is an office building which normally requires 30 parking spaces. The other use is residential apartments which also normally would require 30 spaces. Normally, these two uses would require a total of 60 spaces. However, since the parking demand for these two uses isn't always experiencing peak demand at the same time of day, a reduction can be applied. Adjusting for the fluctuations, this shared parking area would experience its highest combined peak demand during the 8:00 a.m. to 6:00 p.m. weekday time slot, when 45 parking spaces would be needed. The remaining time slots are each less than that, so this parking lot would only be required to provide 45 spaces instead of the original 60. 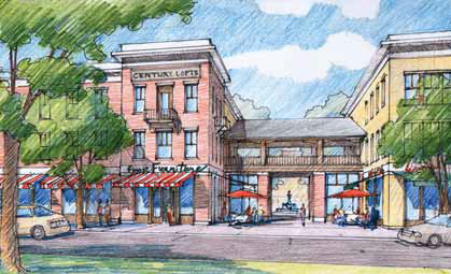 Clifton Park Town Center Plan - design concepts. Figure A.1 - Town Center Plan Concept. A ring or liner of buildings around a central parking structure to serve all of the surrounding businesses. 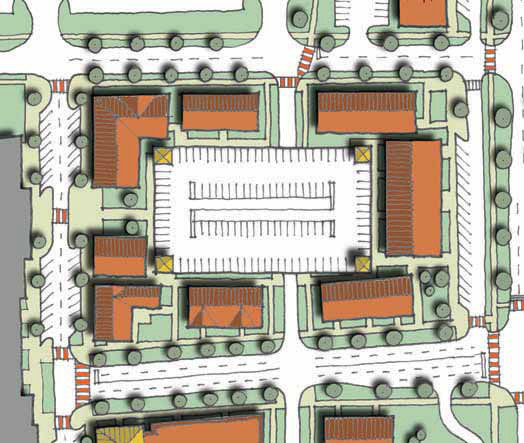 Figure A.2 - Town Center Plan Concept. 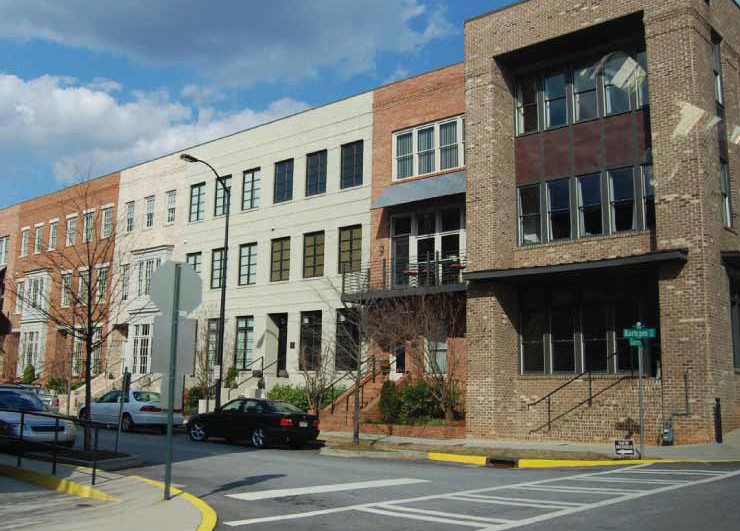 Infill development focuses on defining and fronting new pedestrian streets and open spaces. 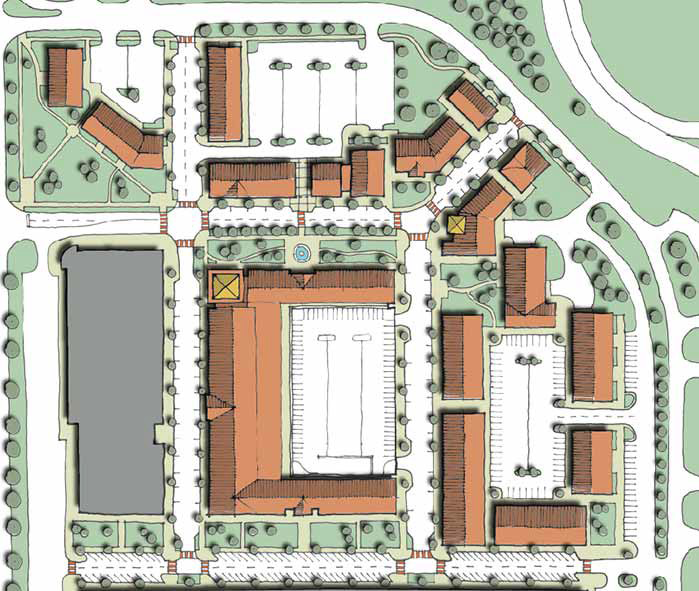 Figure A.3 - Town Center Plan Concept. Smaller scale infill development begins to line the public and private streets, creating shared parking areas inside the blocks. Increased attention has been given to the National Environmental Policy Act (NEPA) related to its ability to balance overall mobility benefits of transportation projects agains protecting quality of life of low-income and minority residents of a community. President Clinton issued Executive Order 12898 to bring attention to environmental and human health impacts of low-income and minority communities-referred to as "environmental justice" - when federal funding is involved. The goal of environmental justice review is to ensure that any adverse human health or environmental effects of a government action, such as a federally supported roadway or transit project, does not disproportionately affect minority or low-income residents of a community or neighborhood. Environmental justice is a public policy objective that can help improve the quality of life for those whose interests have traditionally been overlooked. "EJ population areas" are defined as any census tract with significant populations of minority or low-income persons. The CDTC staff has completed a review of civil rights/environmental justice impacts of transportation actions proposed under this study. Based on a review of the latest socioeconomic data available, the CDTC staff has determined that there are no census, tracts within the study area that contain significant environmental justice populations. CDTC-mapped environmental features within a quarter mile of the study area boundary (see Environmental Mitigation Features Map). Environmental mitigation features within the study area and within a quarter mile of the project site include several water features, wetlands and an aquifer.